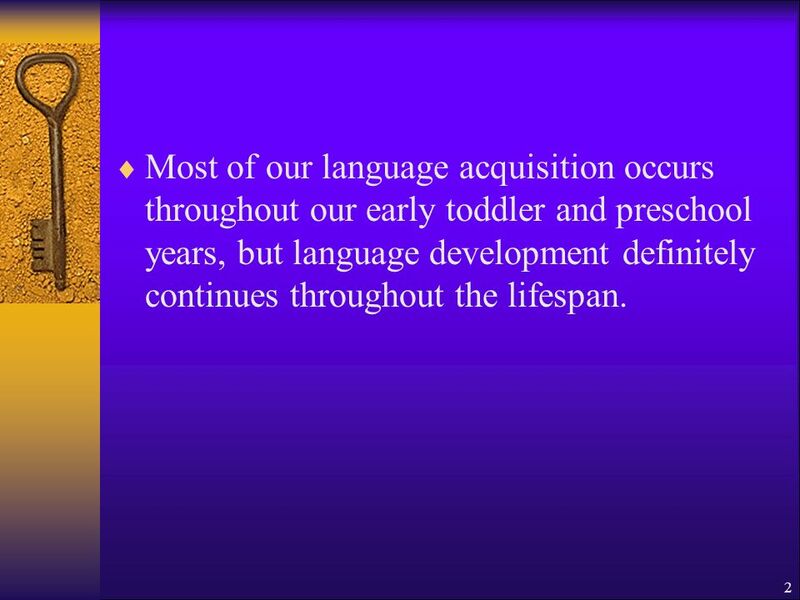 1 Language Development in Early School Years and Adolescence. 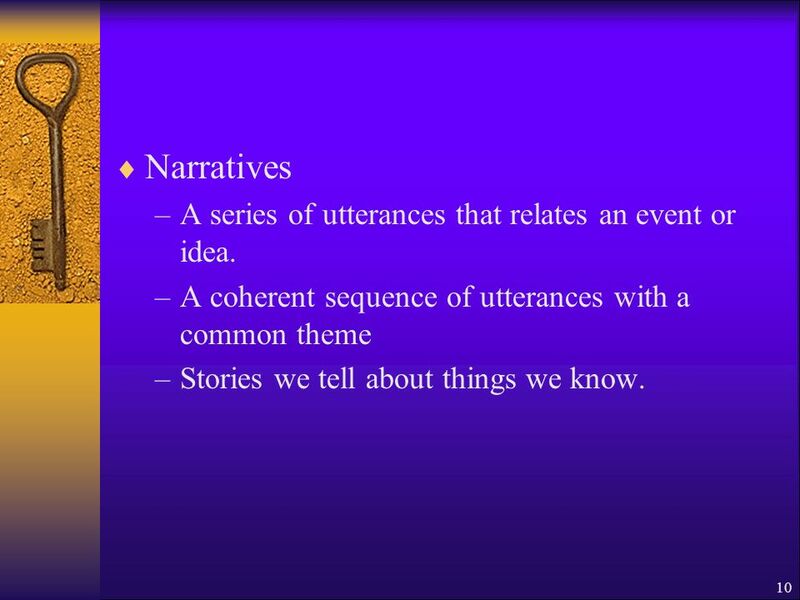 10 10 Narratives –A series of utterances that relates an event or idea. 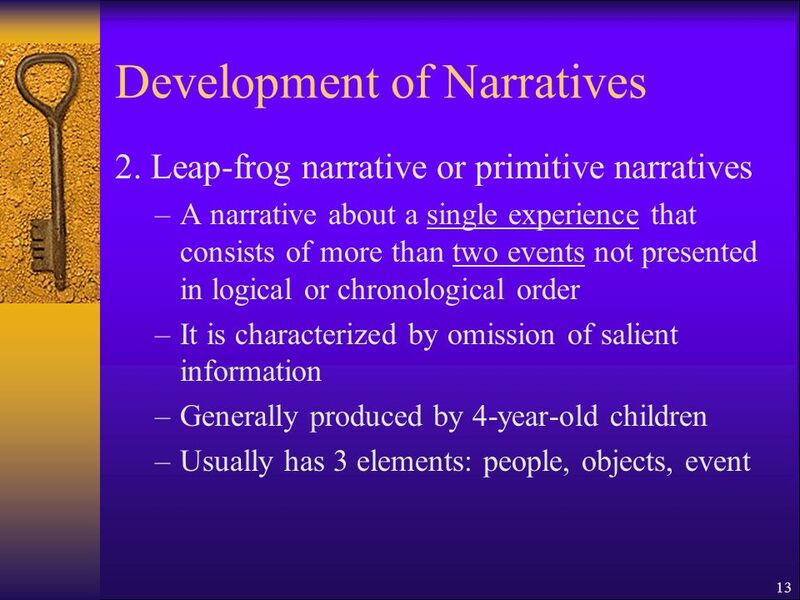 –A coherent sequence of utterances with a common theme –Stories we tell about things we know. 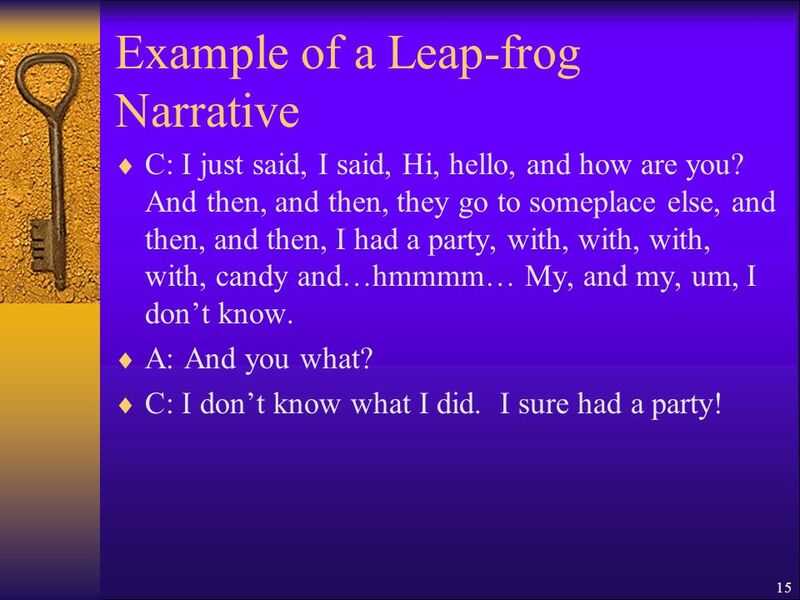 15 15 Example of a Leap-frog Narrative C: I just said, I said, Hi, hello, and how are you? And then, and then, they go to someplace else, and then, and then, I had a party, with, with, with, with, candy and…hmmmm… My, and my, um, I dont know. A: And you what? C: I dont know what I did. I sure had a party! 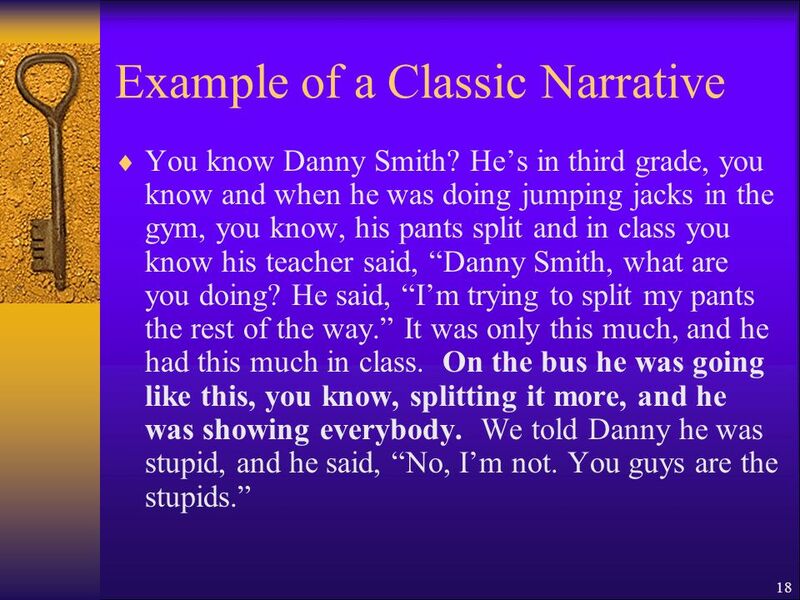 18 18 Example of a Classic Narrative You know Danny Smith? Hes in third grade, you know and when he was doing jumping jacks in the gym, you know, his pants split and in class you know his teacher said, Danny Smith, what are you doing? He said, Im trying to split my pants the rest of the way. It was only this much, and he had this much in class. On the bus he was going like this, you know, splitting it more, and he was showing everybody. We told Danny he was stupid, and he said, No, Im not. You guys are the stupids. 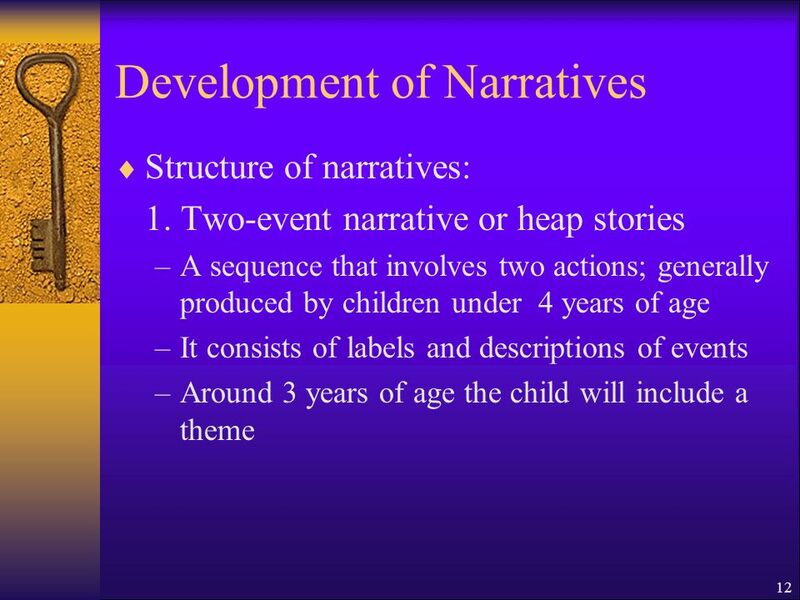 20 20 Four Basic Types of Narrative Discourse (Content of Narratives) 1.Recounts –The speaker talks about a past or personal experience or about an event she has seen or read about. –Are common in the homes of middle-and upper-middle socioeconomic children whose parents often ask the questions, What did you do in school today?, Tell us about your trip to the zoo. 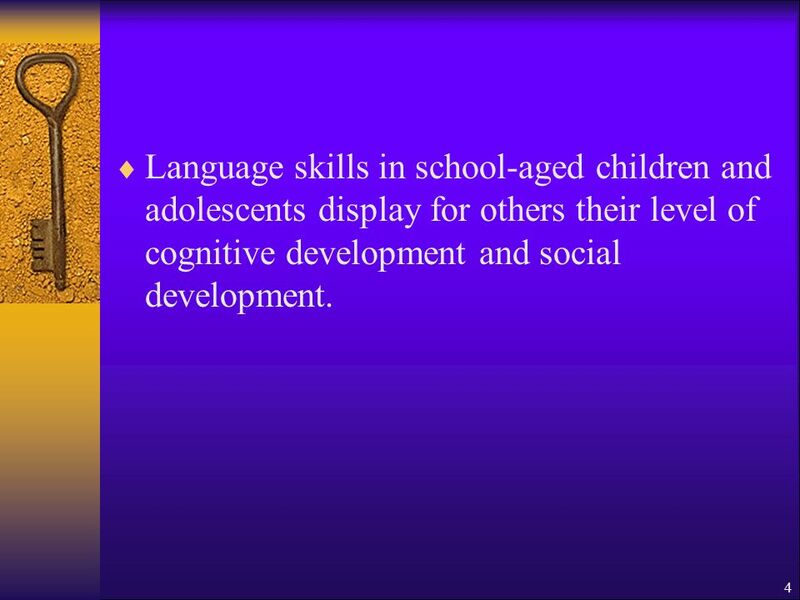 –They are commonly used at school. 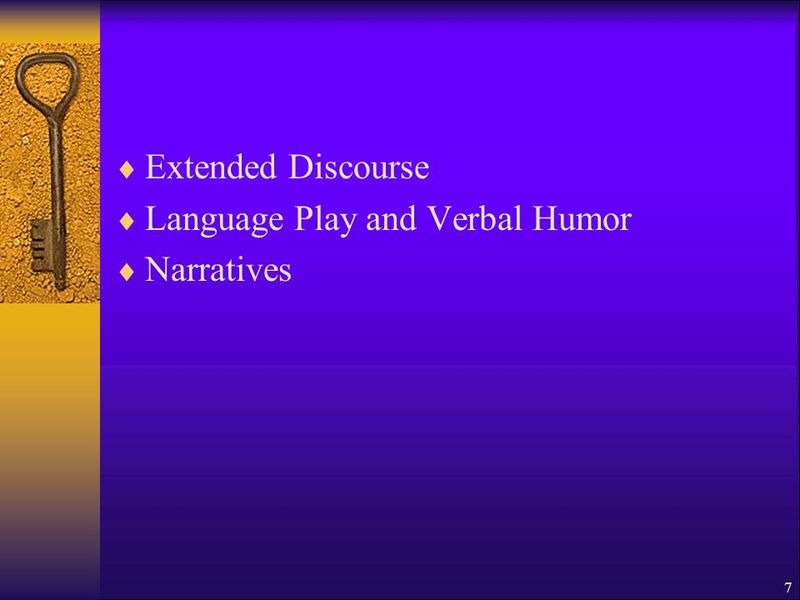 21 21 Four Basic Types of Narrative Discourse 2. 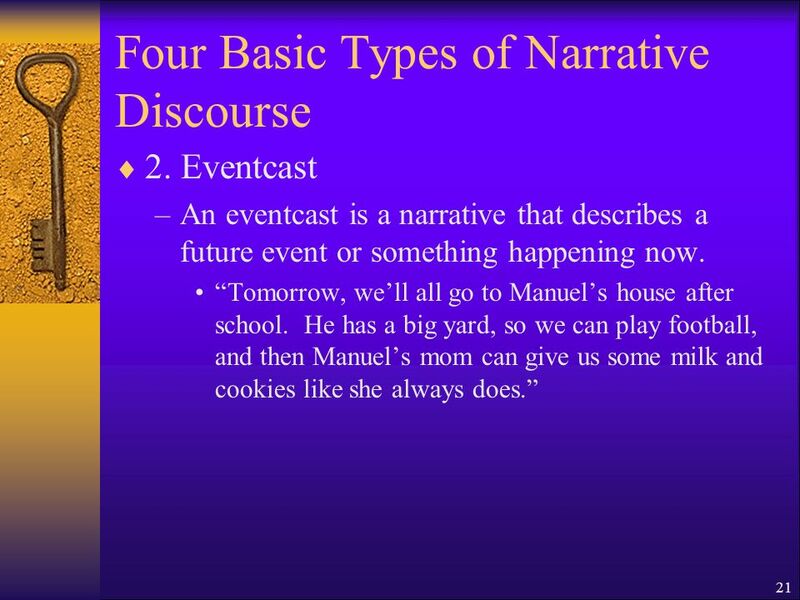 Eventcast –An eventcast is a narrative that describes a future event or something happening now. Tomorrow, well all go to Manuels house after school. He has a big yard, so we can play football, and then Manuels mom can give us some milk and cookies like she always does. 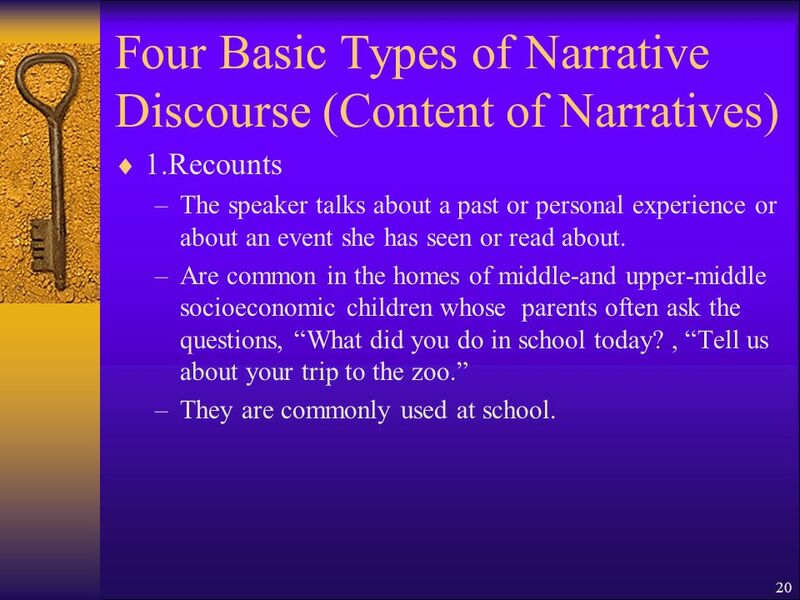 22 22 Four Basic Types of Narrative Discourse 3. 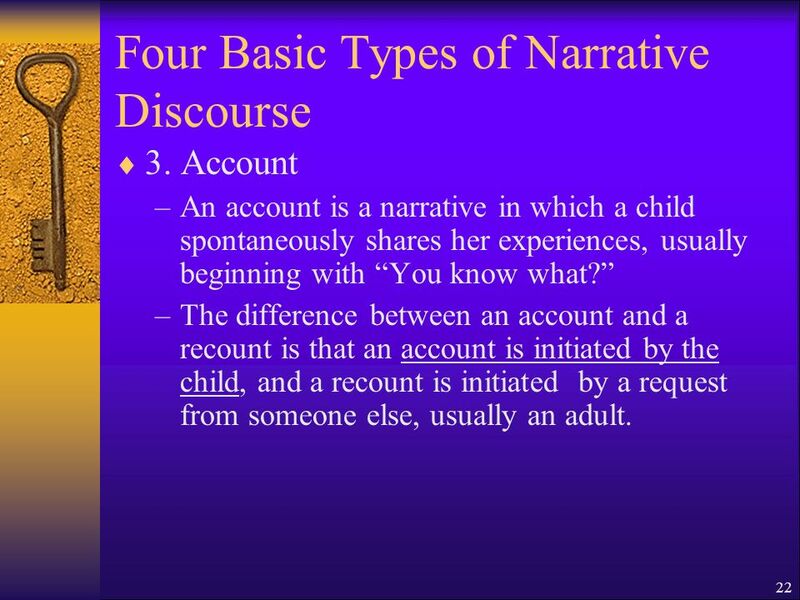 Account –An account is a narrative in which a child spontaneously shares her experiences, usually beginning with You know what? 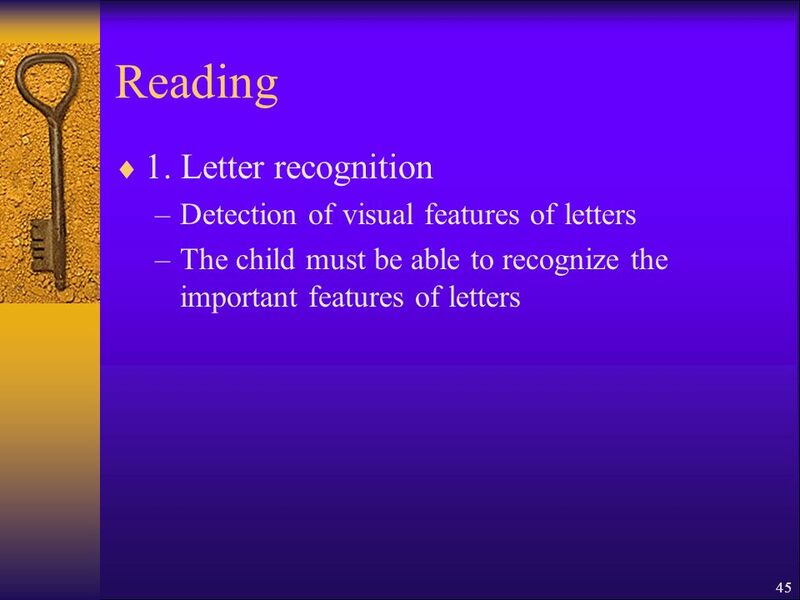 –The difference between an account and a recount is that an account is initiated by the child, and a recount is initiated by a request from someone else, usually an adult. 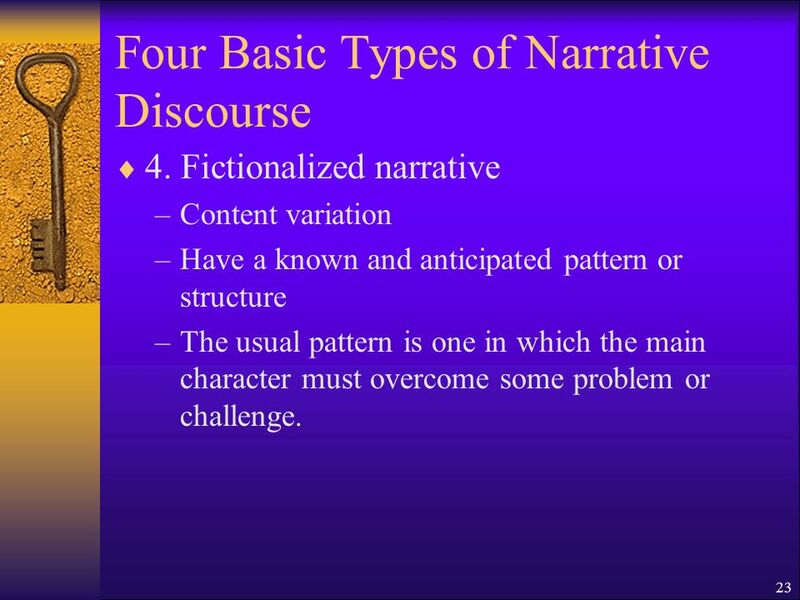 23 23 Four Basic Types of Narrative Discourse 4. 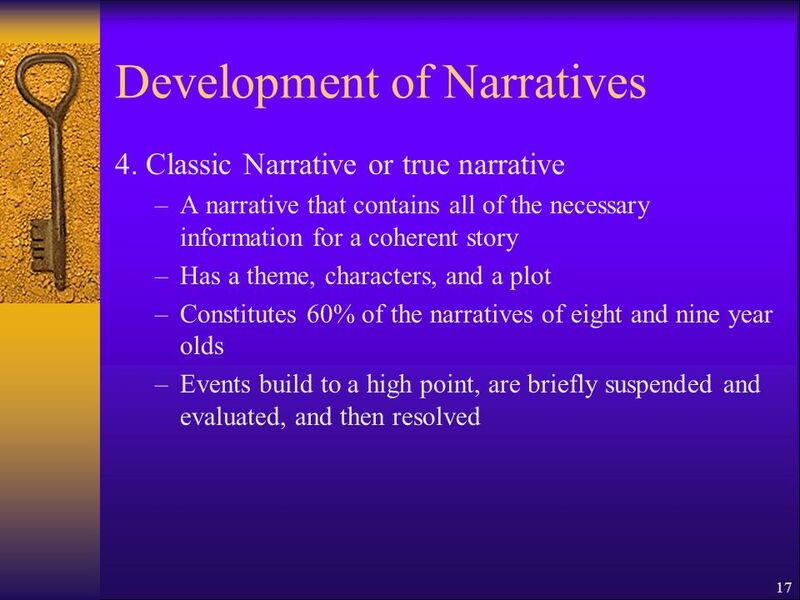 Fictionalized narrative –Content variation –Have a known and anticipated pattern or structure –The usual pattern is one in which the main character must overcome some problem or challenge. 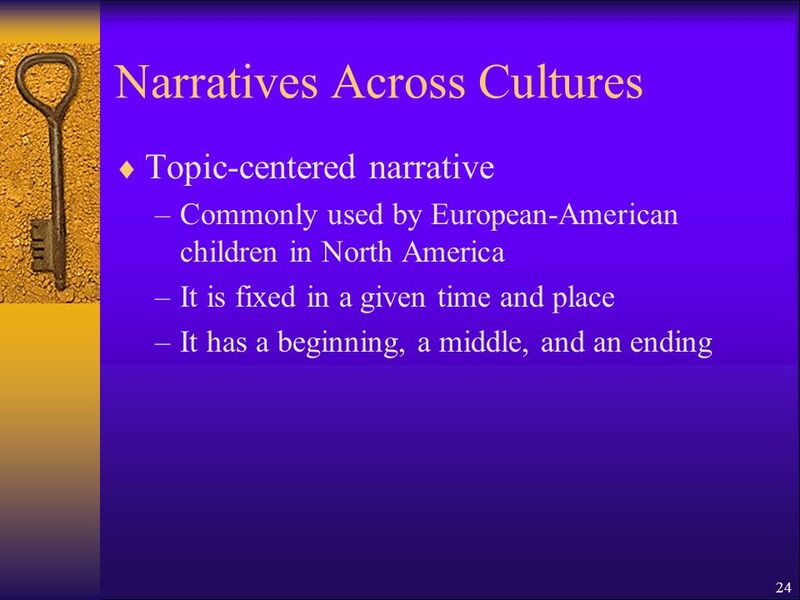 25 25 Narratives Across Cultures Topic-associating narrative –Commonly used by African-American children –This narrative shifts in time, place, and key characters –Children put together several anecdotes thematically. 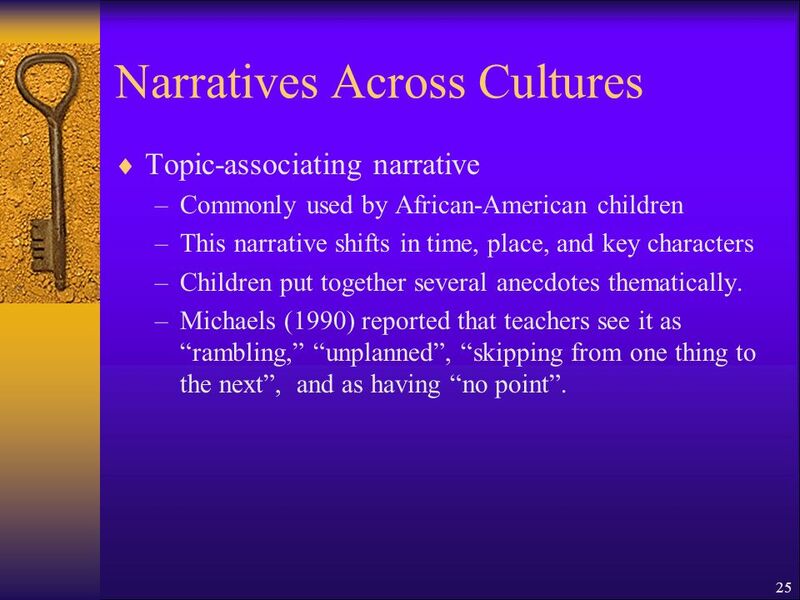 –Michaels (1990) reported that teachers see it as rambling, unplanned, skipping from one thing to the next, and as having no point. 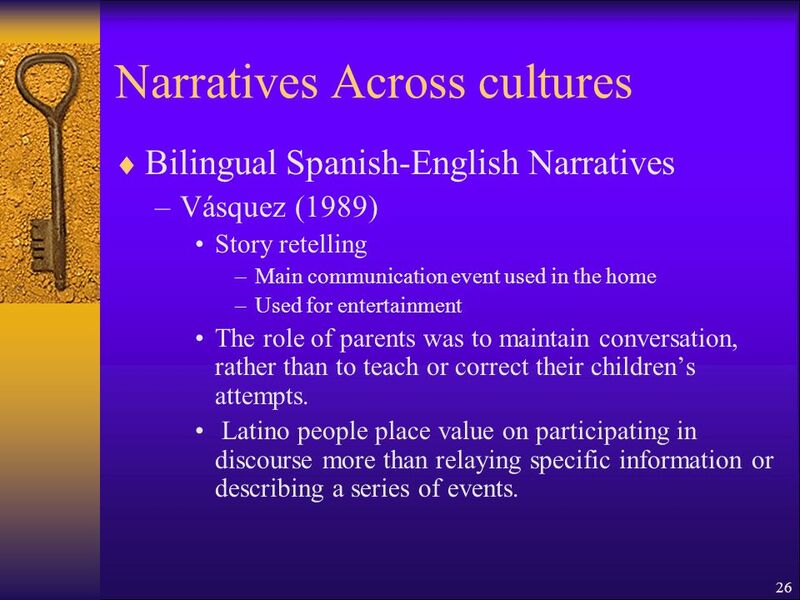 26 26 Narratives Across cultures Bilingual Spanish-English Narratives –Vásquez (1989) Story retelling –Main communication event used in the home –Used for entertainment The role of parents was to maintain conversation, rather than to teach or correct their childrens attempts. 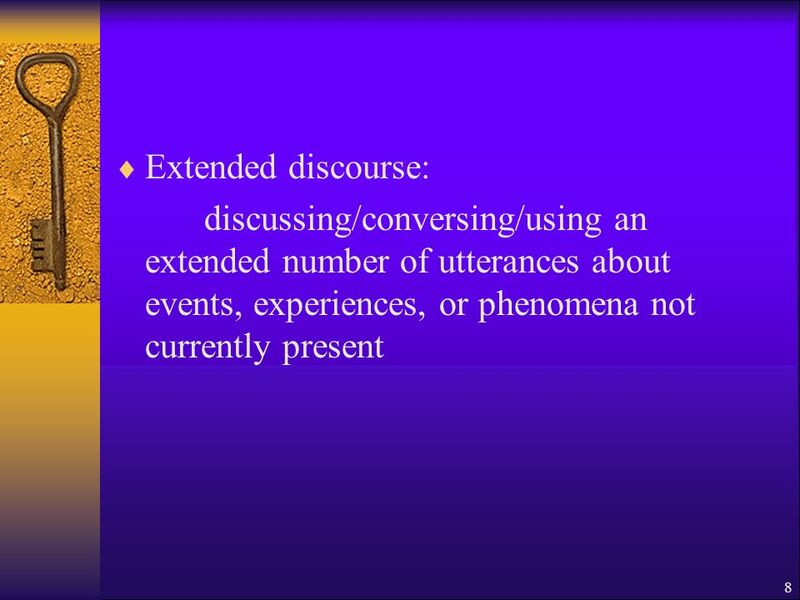 Latino people place value on participating in discourse more than relaying specific information or describing a series of events. 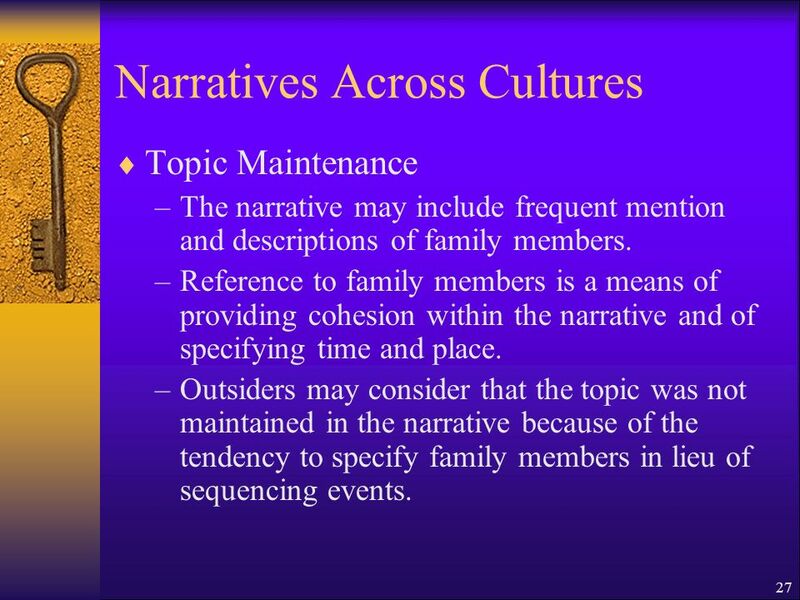 27 27 Narratives Across Cultures Topic Maintenance –The narrative may include frequent mention and descriptions of family members. 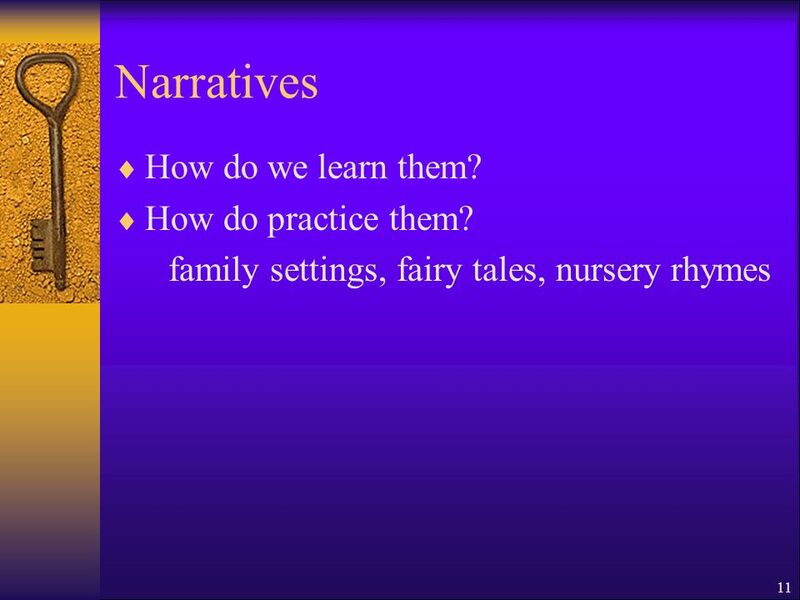 –Reference to family members is a means of providing cohesion within the narrative and of specifying time and place. –Outsiders may consider that the topic was not maintained in the narrative because of the tendency to specify family members in lieu of sequencing events. 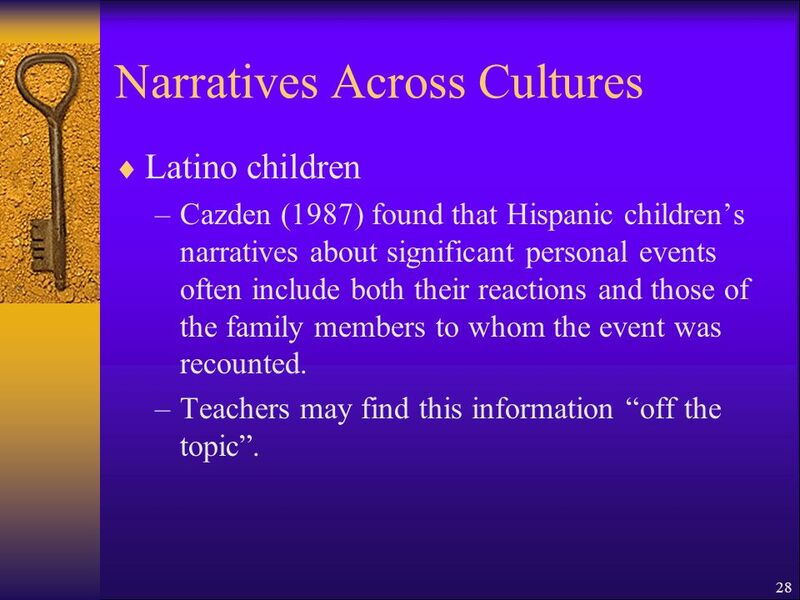 28 28 Narratives Across Cultures Latino children –Cazden (1987) found that Hispanic childrens narratives about significant personal events often include both their reactions and those of the family members to whom the event was recounted. 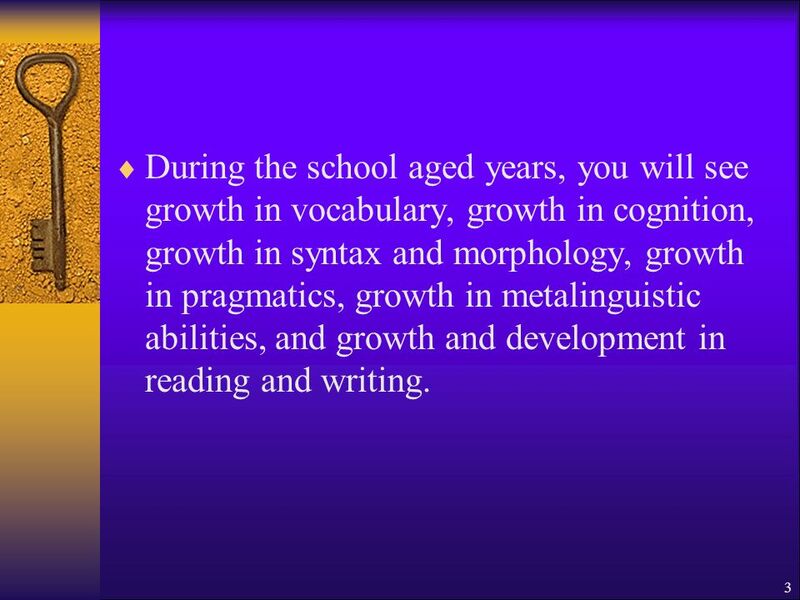 –Teachers may find this information off the topic. 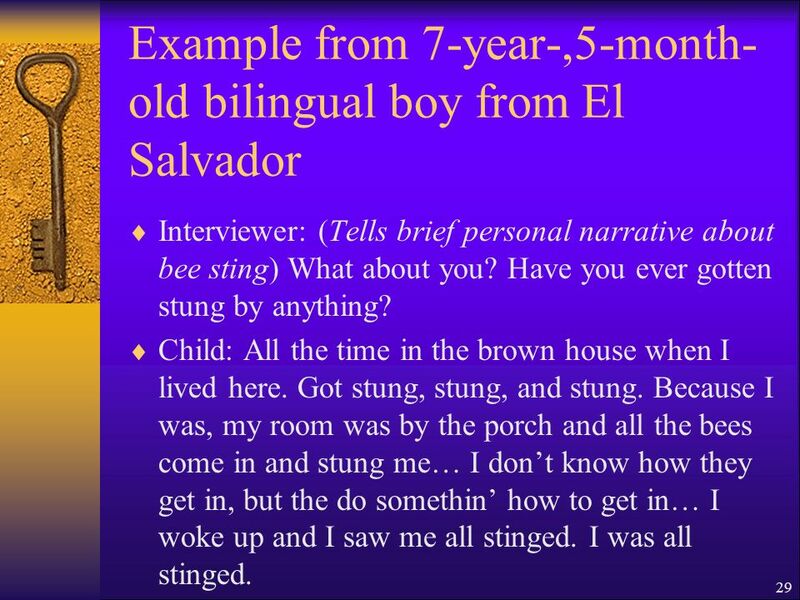 29 29 Example from 7-year-,5-month- old bilingual boy from El Salvador Interviewer: (Tells brief personal narrative about bee sting) What about you? Have you ever gotten stung by anything? Child: All the time in the brown house when I lived here. Got stung, stung, and stung. Because I was, my room was by the porch and all the bees come in and stung me… I dont know how they get in, but the do somethin how to get in… I woke up and I saw me all stinged. I was all stinged. 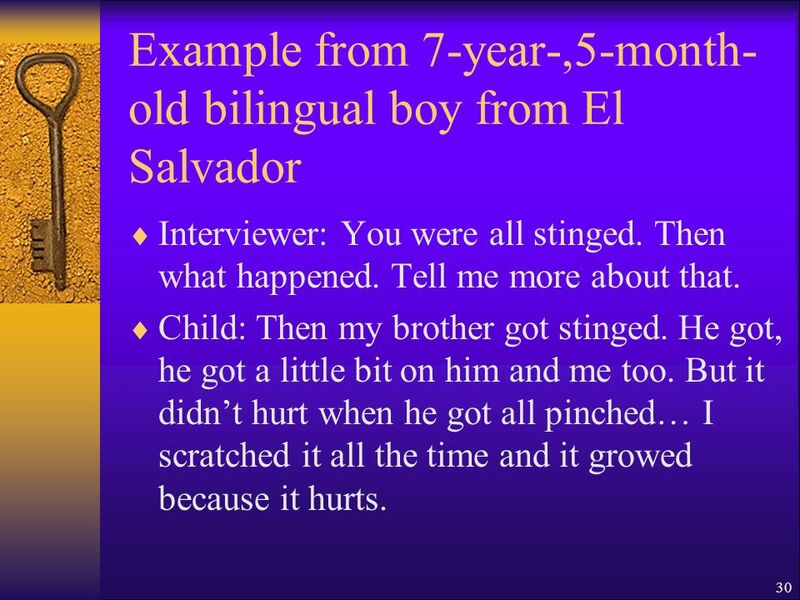 30 30 Example from 7-year-,5-month- old bilingual boy from El Salvador Interviewer: You were all stinged. Then what happened. Tell me more about that. Child: Then my brother got stinged. He got, he got a little bit on him and me too. But it didnt hurt when he got all pinched… I scratched it all the time and it growed because it hurts. 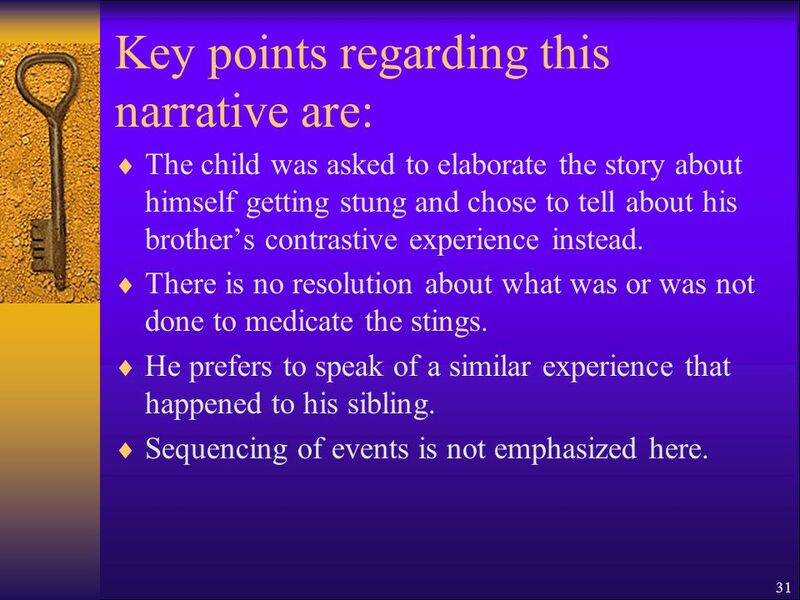 31 31 Key points regarding this narrative are: The child was asked to elaborate the story about himself getting stung and chose to tell about his brothers contrastive experience instead. There is no resolution about what was or was not done to medicate the stings. He prefers to speak of a similar experience that happened to his sibling. 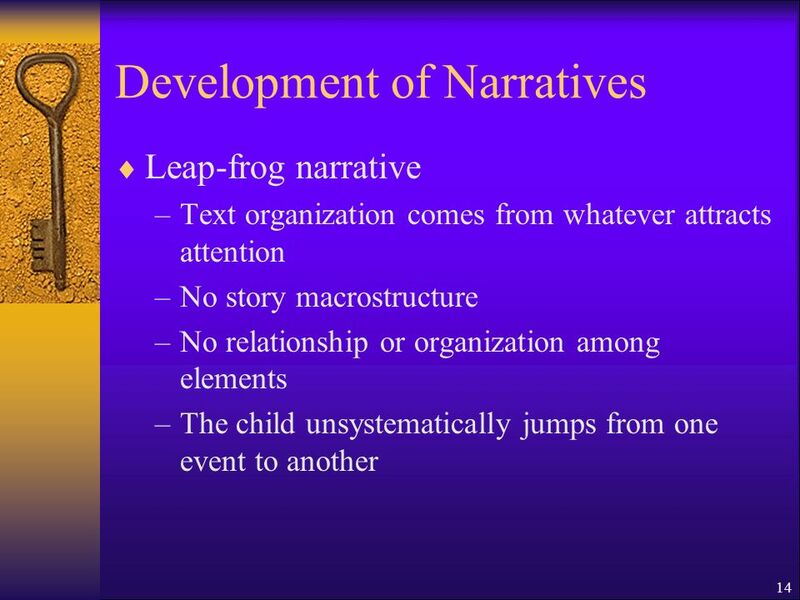 Sequencing of events is not emphasized here. 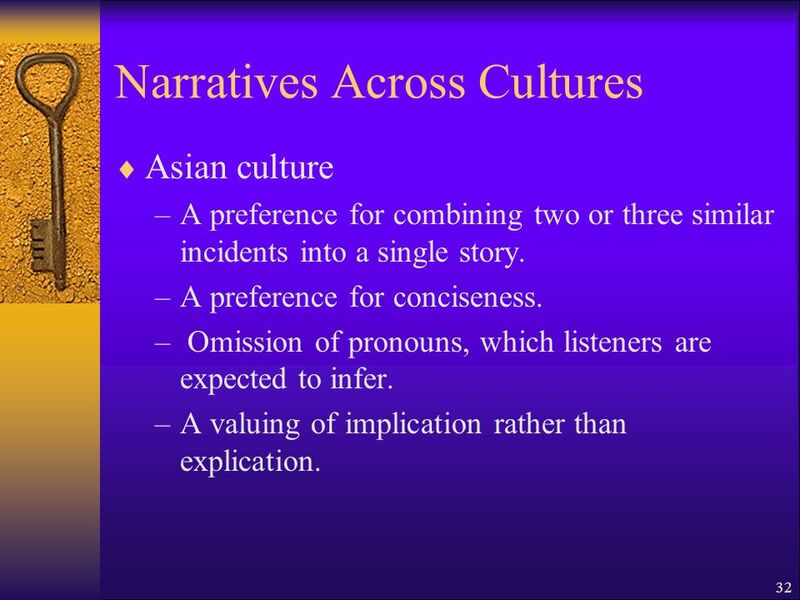 32 32 Narratives Across Cultures Asian culture –A preference for combining two or three similar incidents into a single story. –A preference for conciseness. 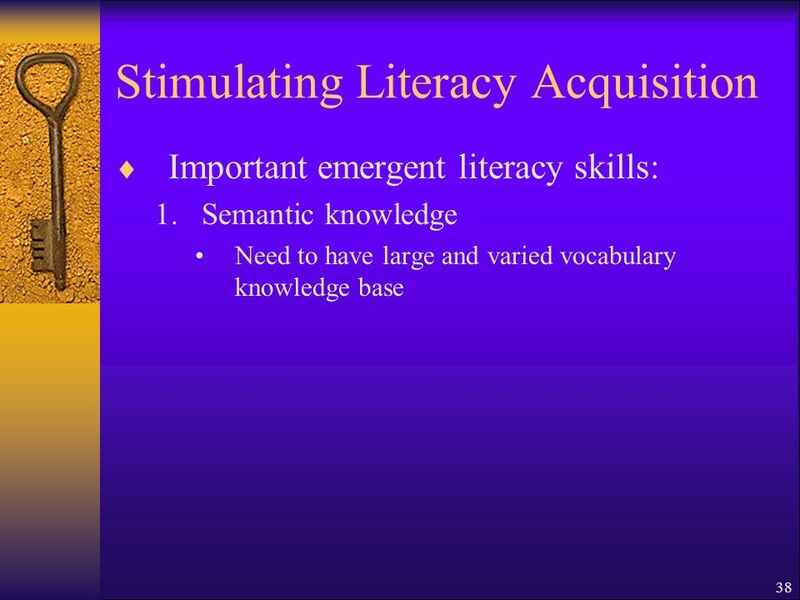 – Omission of pronouns, which listeners are expected to infer. –A valuing of implication rather than explication. 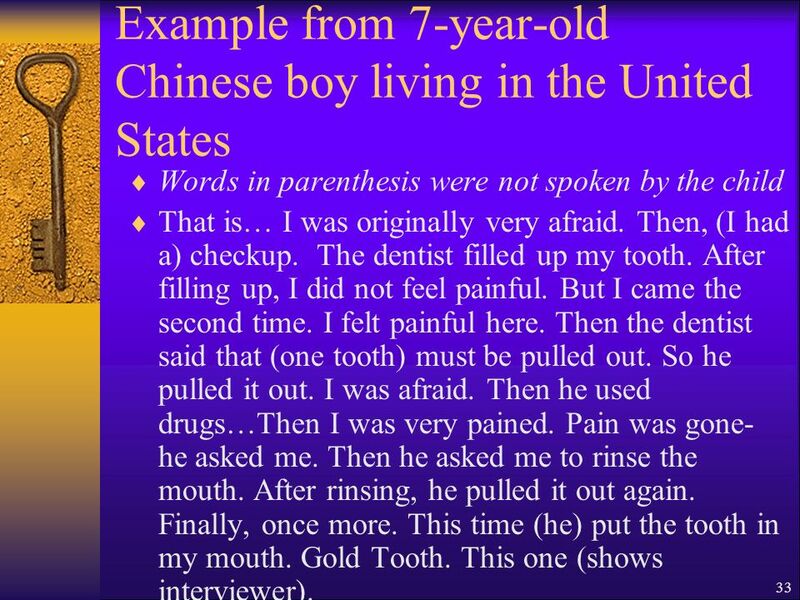 33 33 Example from 7-year-old Chinese boy living in the United States Words in parenthesis were not spoken by the child That is… I was originally very afraid. Then, (I had a) checkup. The dentist filled up my tooth. After filling up, I did not feel painful. But I came the second time. I felt painful here. Then the dentist said that (one tooth) must be pulled out. So he pulled it out. I was afraid. Then he used drugs…Then I was very pained. Pain was gone- he asked me. Then he asked me to rinse the mouth. After rinsing, he pulled it out again. Finally, once more. This time (he) put the tooth in my mouth. Gold Tooth. This one (shows interviewer). 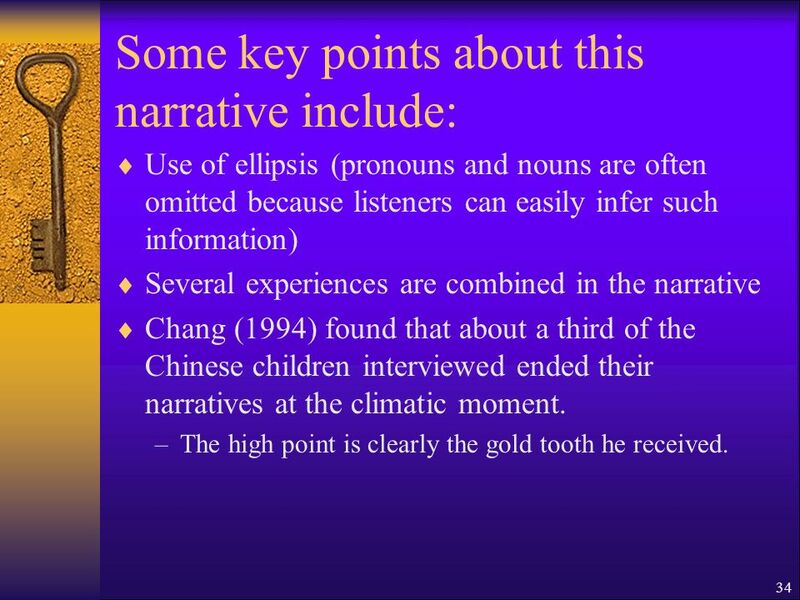 34 34 Some key points about this narrative include: Use of ellipsis (pronouns and nouns are often omitted because listeners can easily infer such information) Several experiences are combined in the narrative Chang (1994) found that about a third of the Chinese children interviewed ended their narratives at the climatic moment. –The high point is clearly the gold tooth he received. 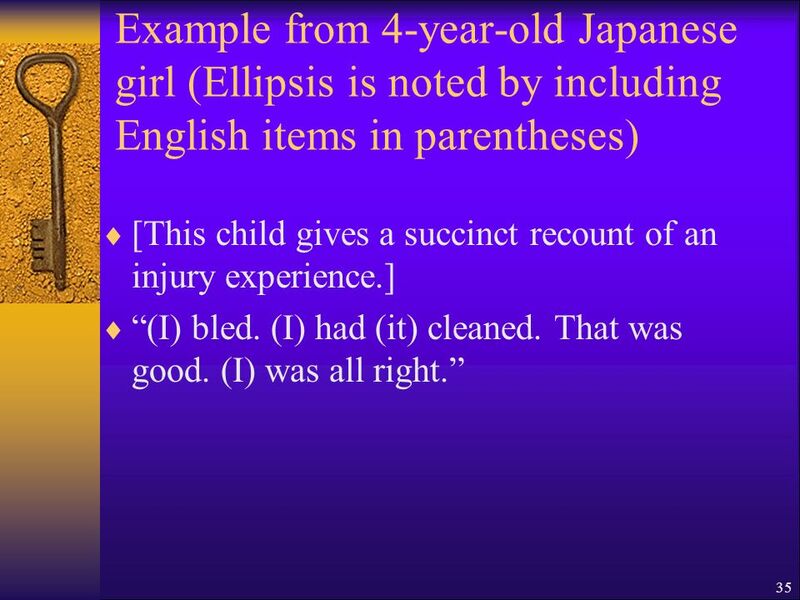 35 35 Example from 4-year-old Japanese girl (Ellipsis is noted by including English items in parentheses) [This child gives a succinct recount of an injury experience.] (I) bled. (I) had (it) cleaned. That was good. (I) was all right. 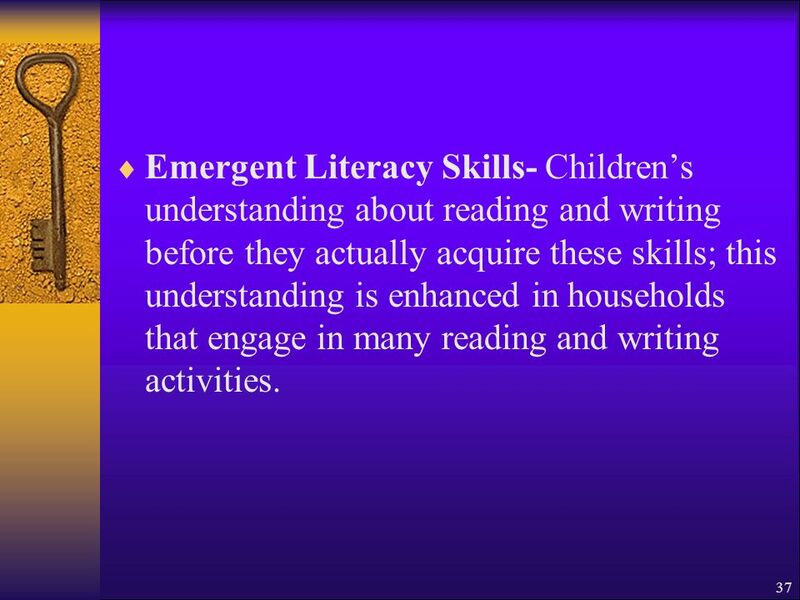 37 37 Emergent Literacy Skills- Childrens understanding about reading and writing before they actually acquire these skills; this understanding is enhanced in households that engage in many reading and writing activities. 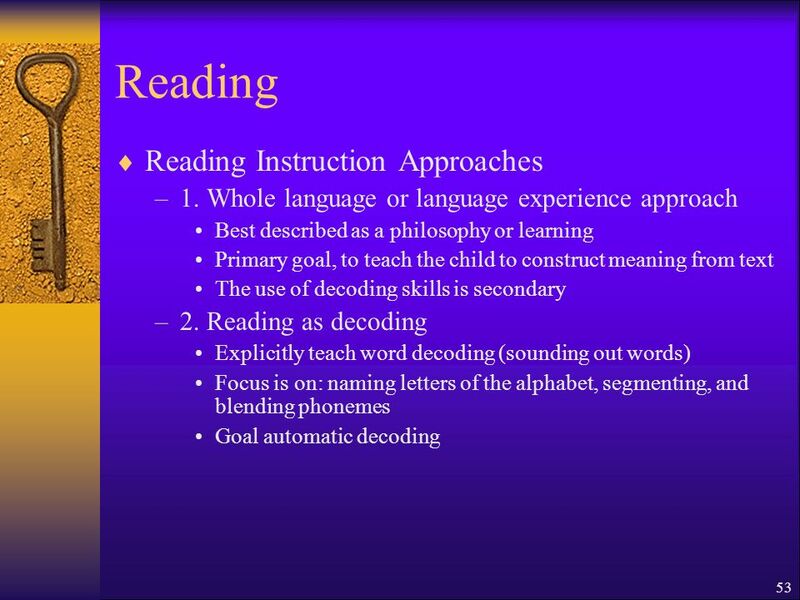 46 46 Reading 2. 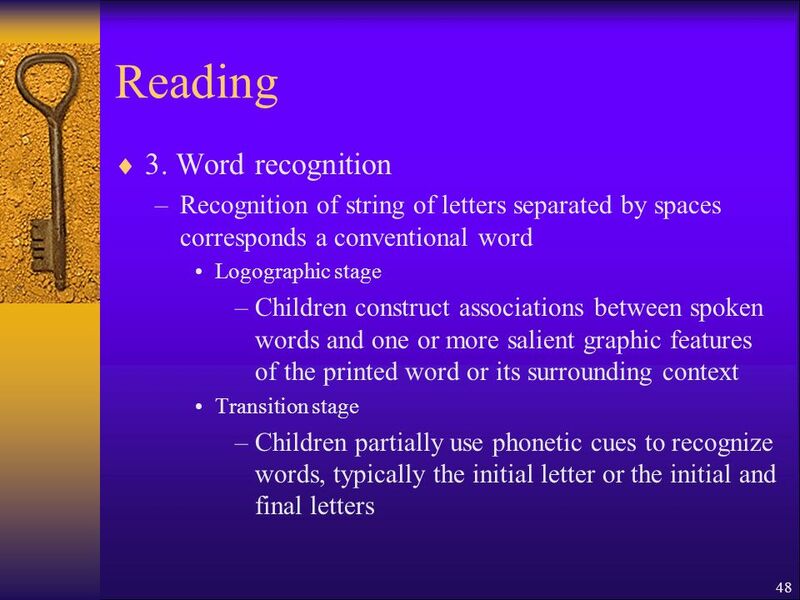 Knowledge of the grapheme-phoneme correspondence rules –Which is the ability to use sound-letter correspondences to decode new words. 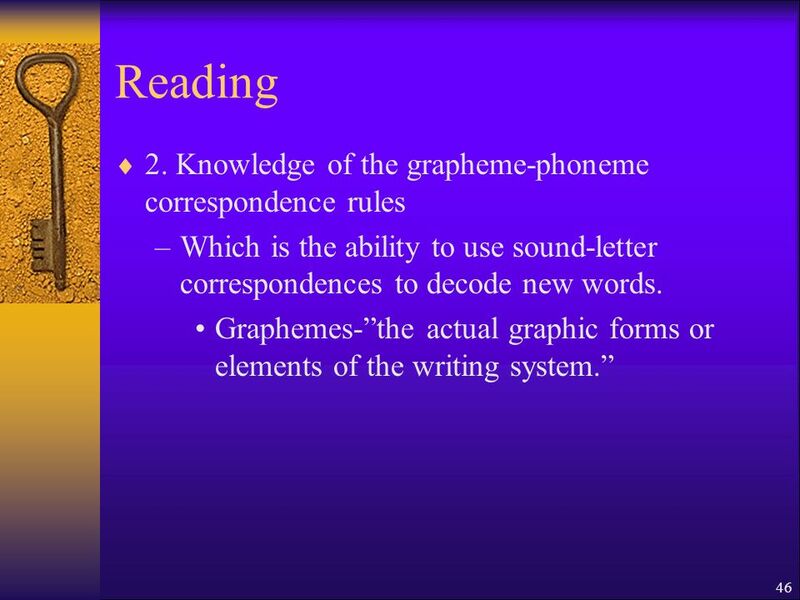 Graphemes-the actual graphic forms or elements of the writing system. 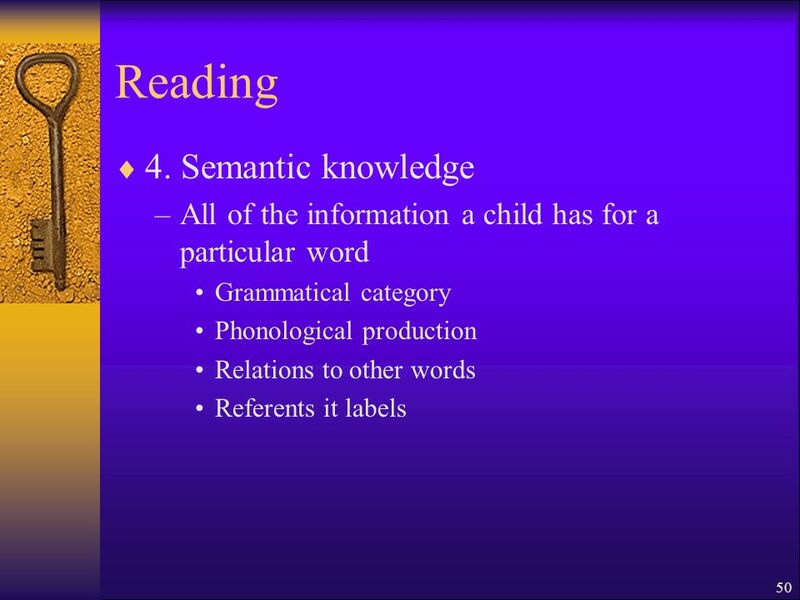 47 47 Reading –Shallow orthographies A spelling system in which there exists a close relationship (one-to-one) between graphemes and the phonemes they represent (e.g., Italian, Spanish). 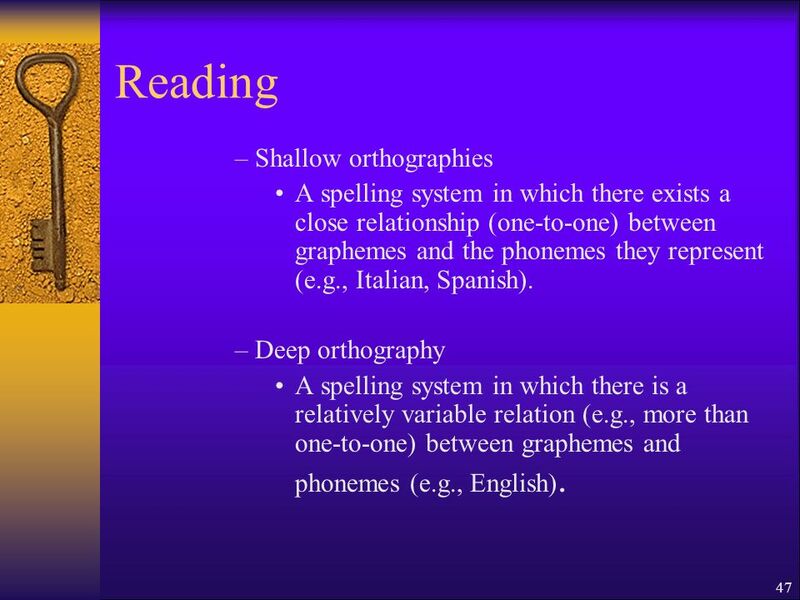 –Deep orthography A spelling system in which there is a relatively variable relation (e.g., more than one-to-one) between graphemes and phonemes (e.g., English). 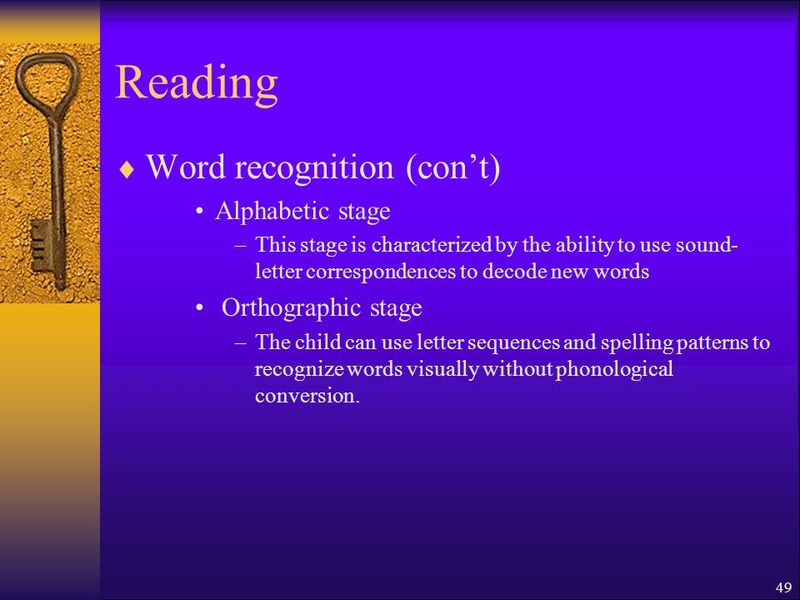 49 49 Reading Word recognition (cont) Alphabetic stage –This stage is characterized by the ability to use sound- letter correspondences to decode new words Orthographic stage –The child can use letter sequences and spelling patterns to recognize words visually without phonological conversion. 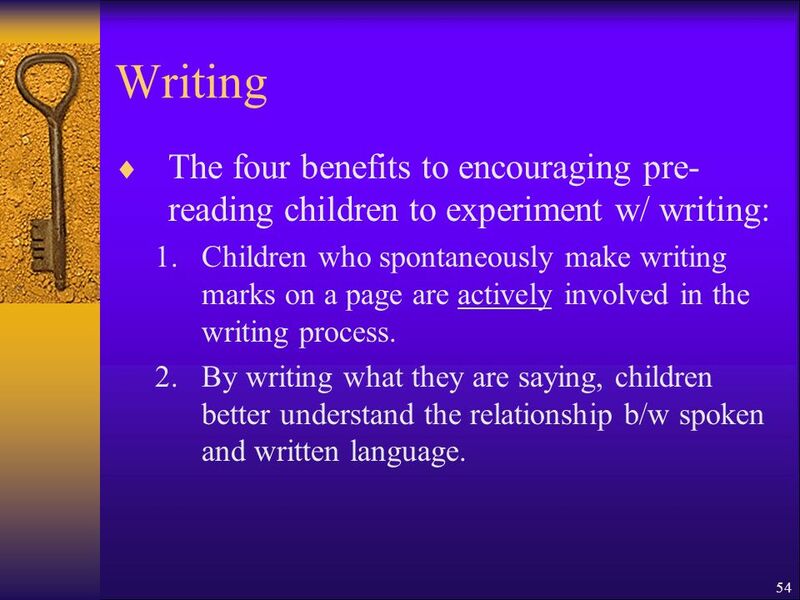 54 54 Writing The four benefits to encouraging pre- reading children to experiment w/ writing: 1.Children who spontaneously make writing marks on a page are actively involved in the writing process. 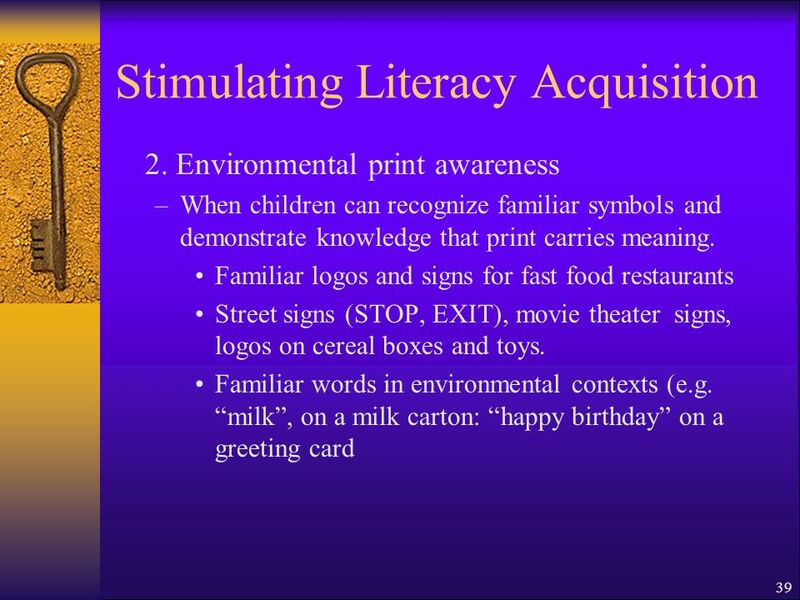 2.By writing what they are saying, children better understand the relationship b/w spoken and written language. 55 55 Writing 3. 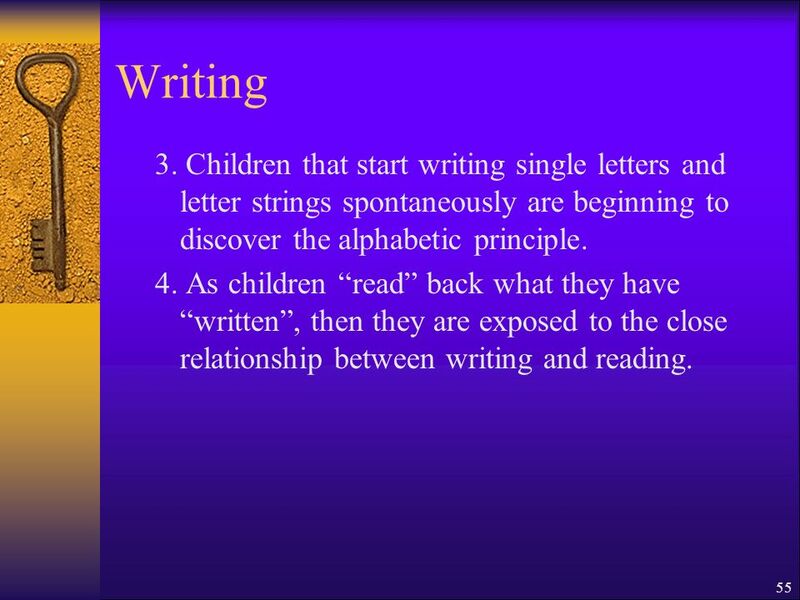 Children that start writing single letters and letter strings spontaneously are beginning to discover the alphabetic principle. 4. 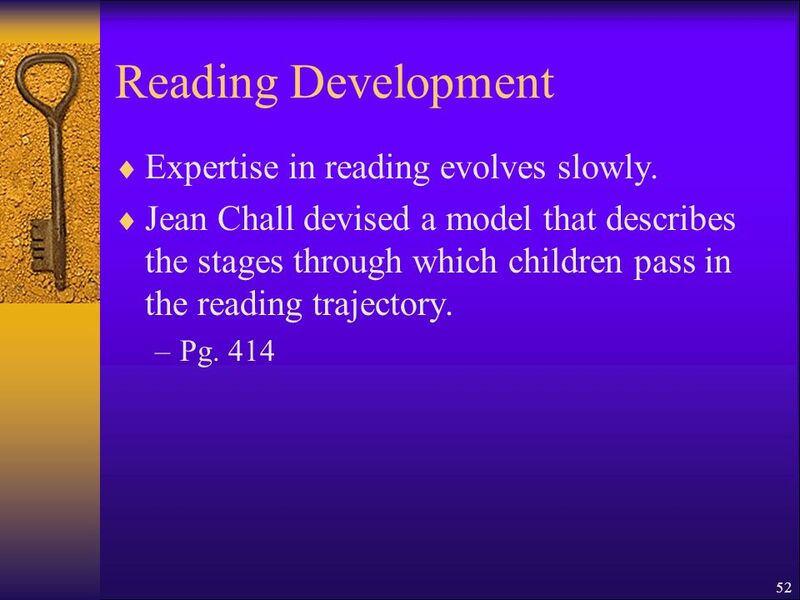 As children read back what they have written, then they are exposed to the close relationship between writing and reading. 57 57 Writing II. 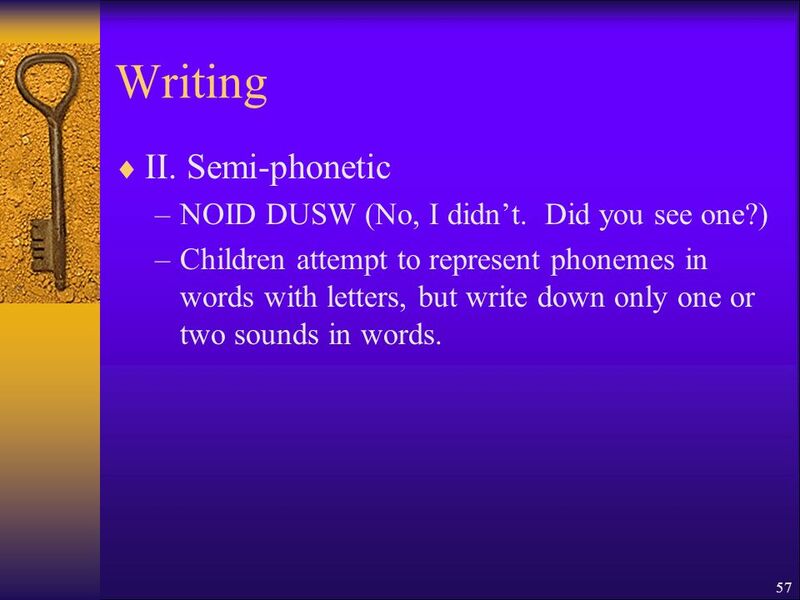 Semi-phonetic –NOID DUSW (No, I didnt. Did you see one?) 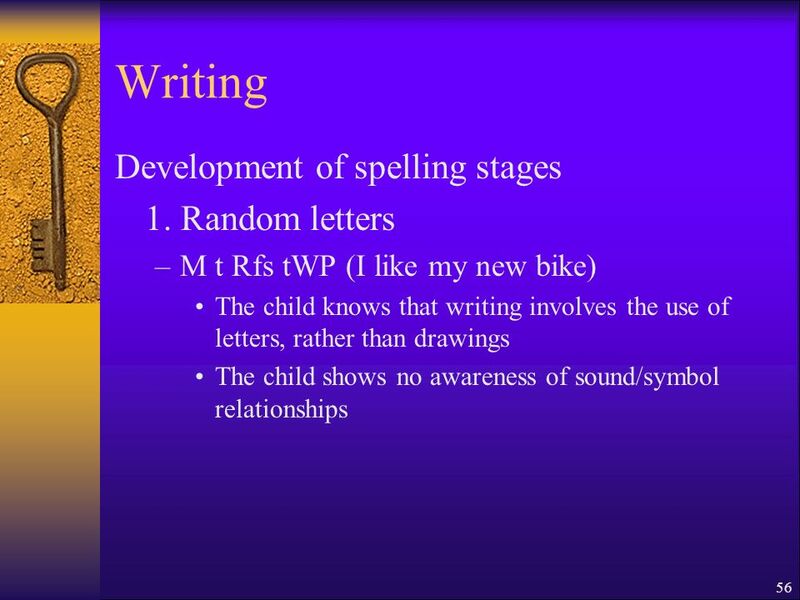 –Children attempt to represent phonemes in words with letters, but write down only one or two sounds in words. 58 58 Writing III. 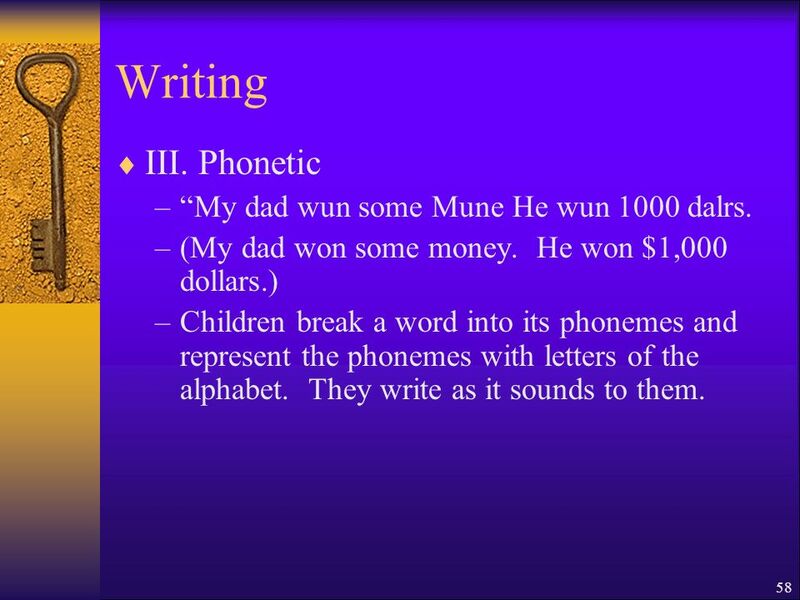 Phonetic –My dad wun some Mune He wun 1000 dalrs. –(My dad won some money. He won $1,000 dollars.) 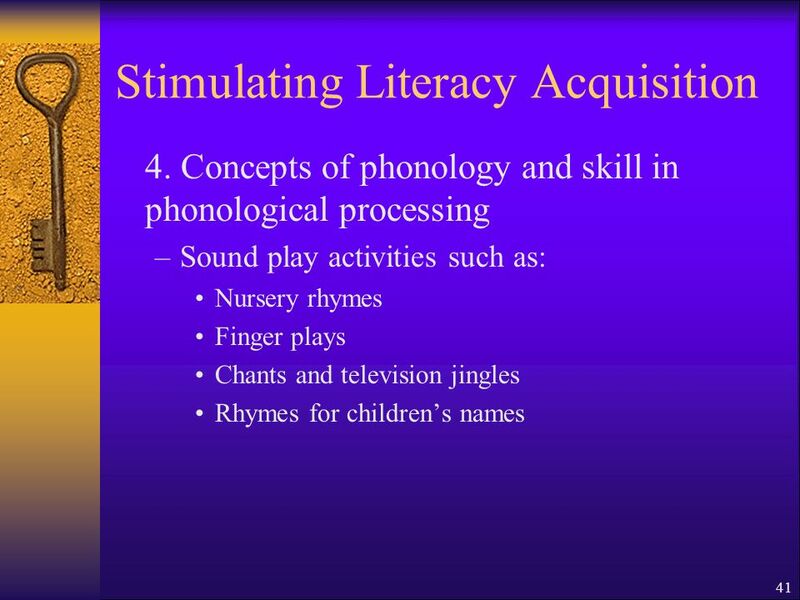 –Children break a word into its phonemes and represent the phonemes with letters of the alphabet. They write as it sounds to them. 59 59 Writing IV. 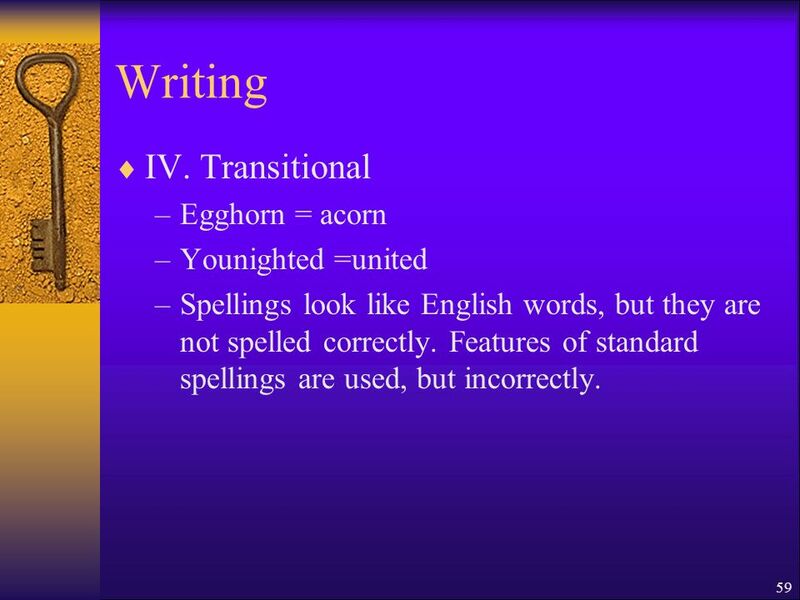 Transitional –Egghorn = acorn –Younighted =united –Spellings look like English words, but they are not spelled correctly. 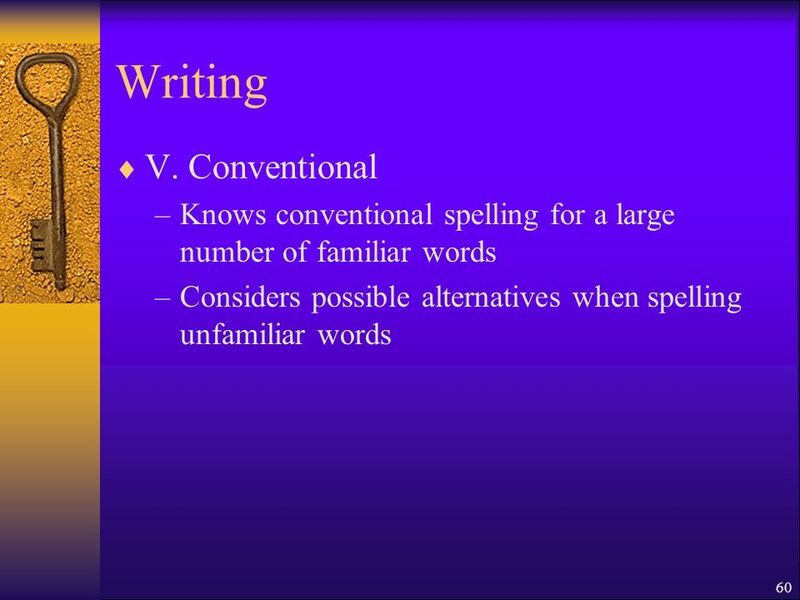 Features of standard spellings are used, but incorrectly. 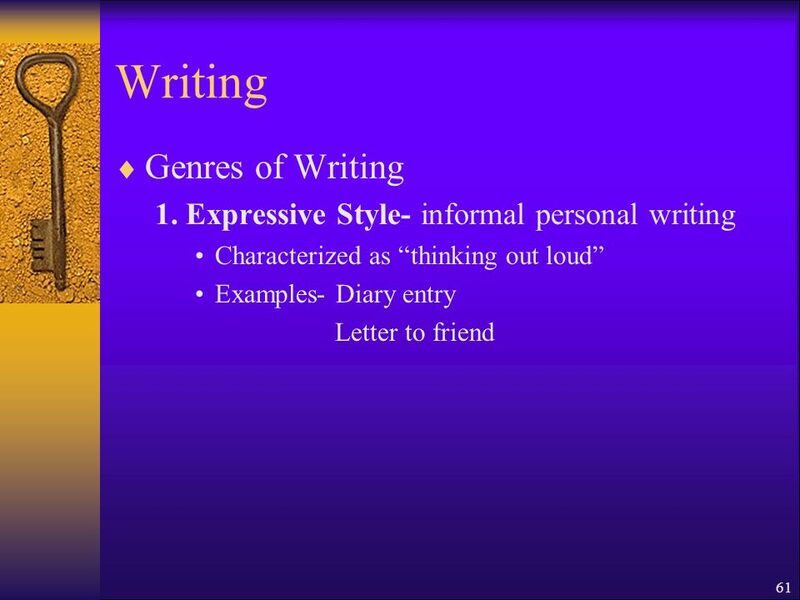 62 62 Writing Genres of Writing 2. 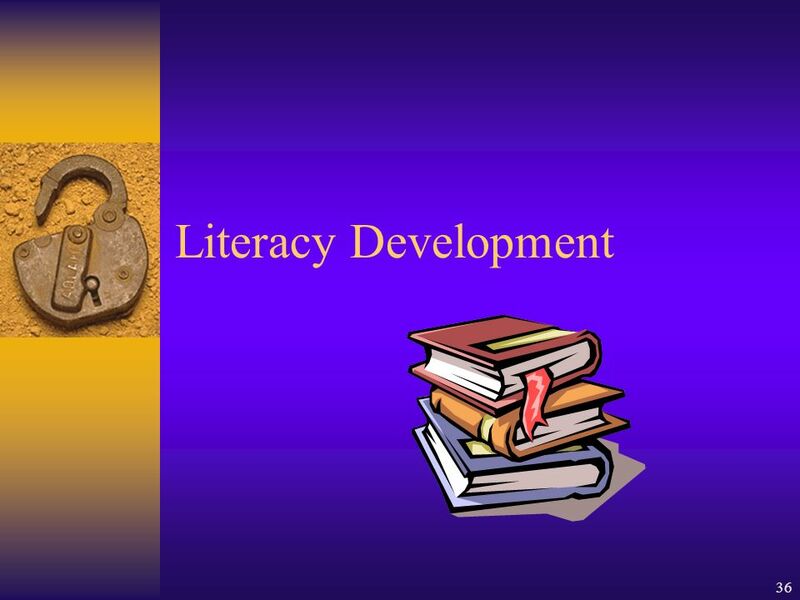 Expository writing- organized text with key points and arguments presented clearly, concisely, and logically. 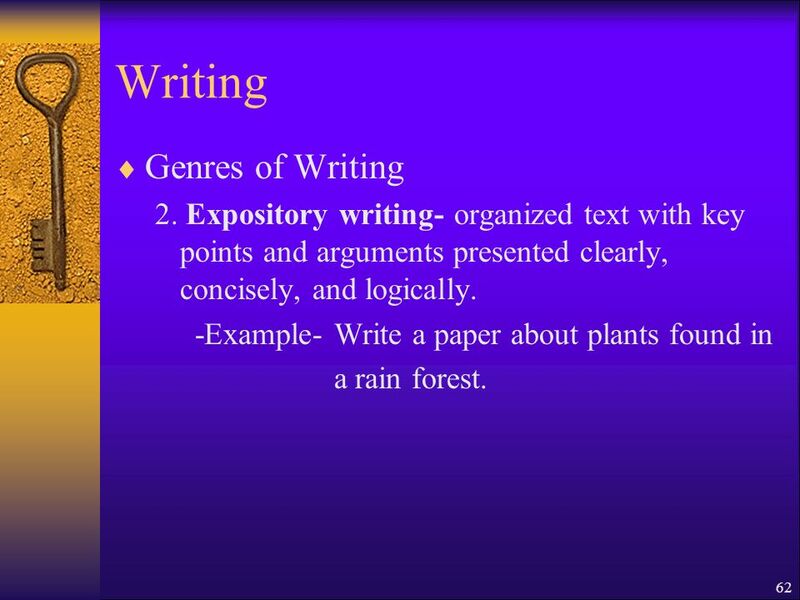 -Example- Write a paper about plants found in a rain forest. 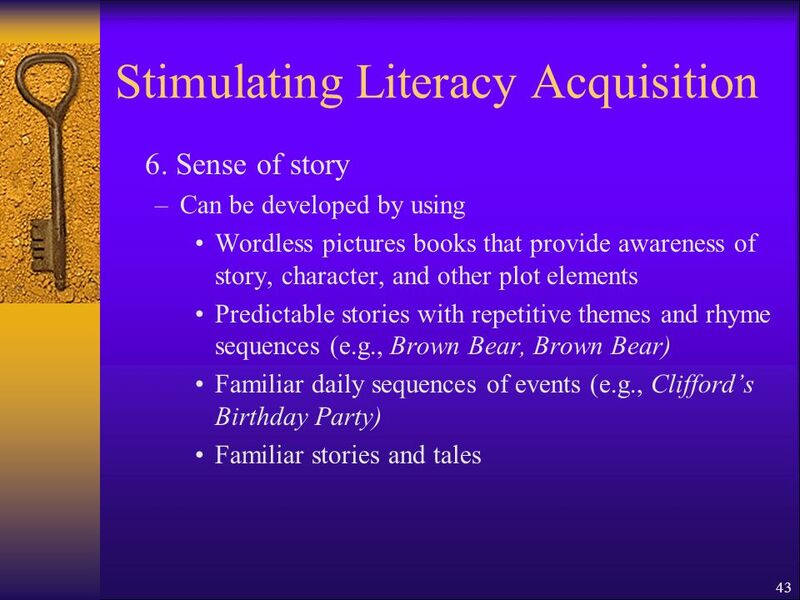 63 63 Writing Genres of Writing 3. 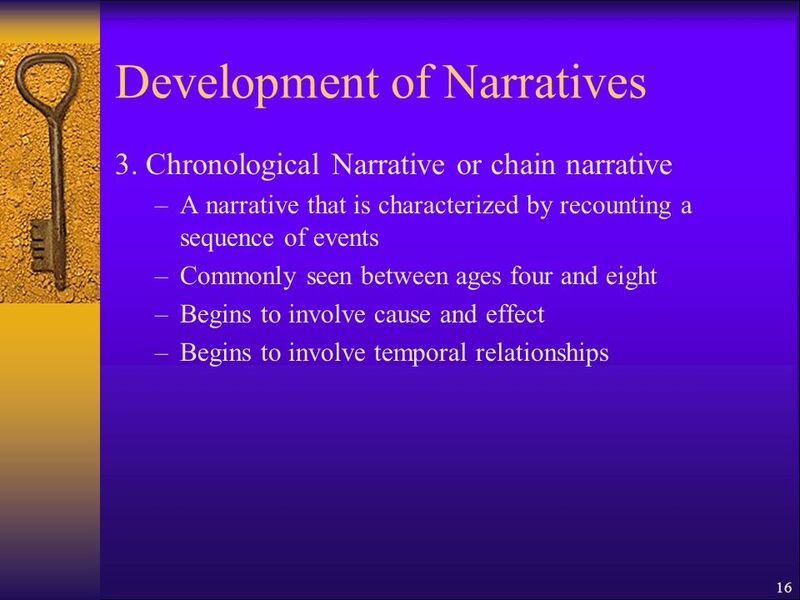 Narrative Writing-organized chronologically and uses time line as its organizational basis. 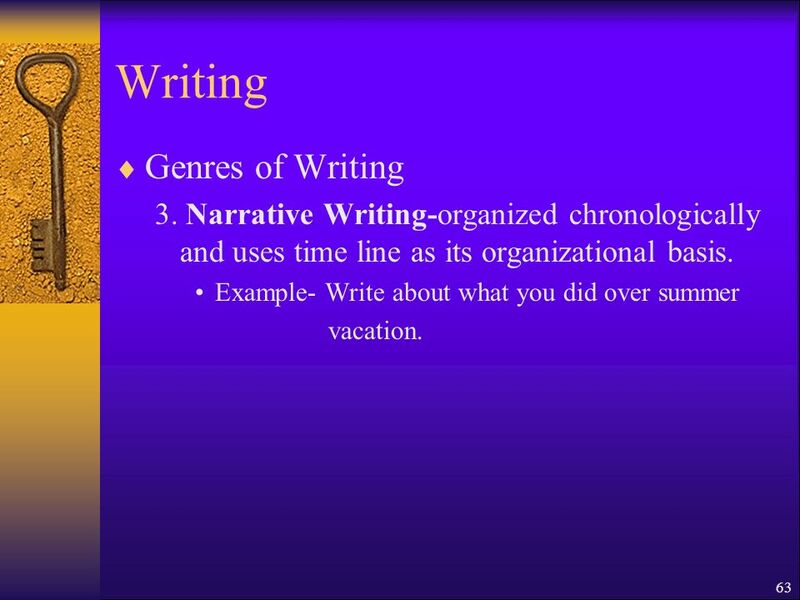 Example- Write about what you did over summer vacation. 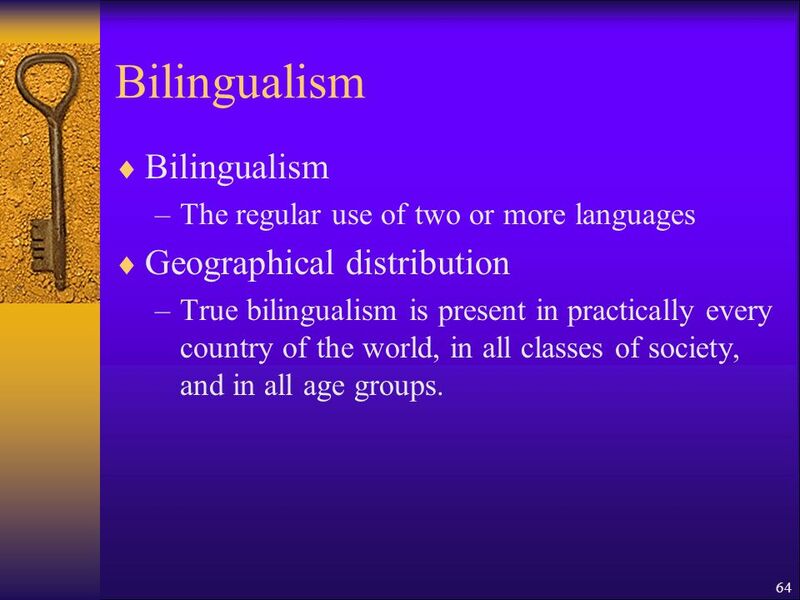 64 64 Bilingualism –The regular use of two or more languages Geographical distribution –True bilingualism is present in practically every country of the world, in all classes of society, and in all age groups. 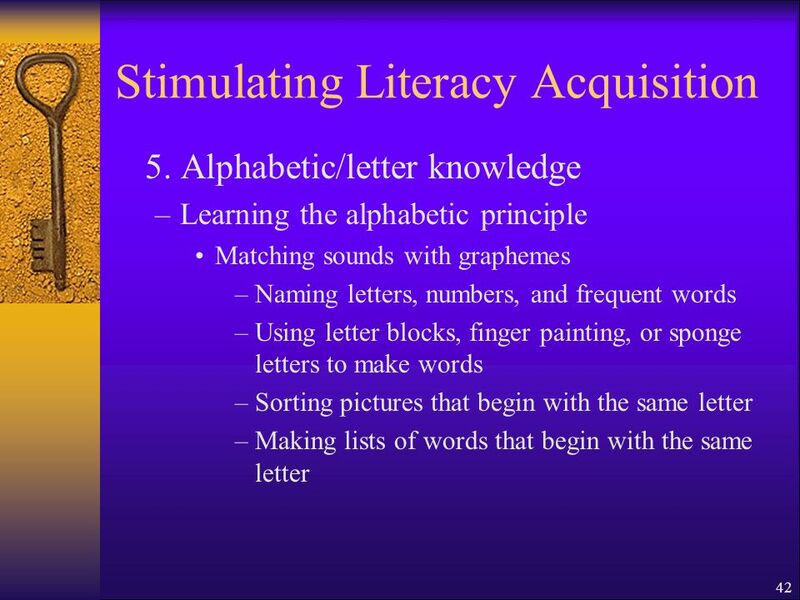 65 65 Bilingualism Acquisition of another language: 1. 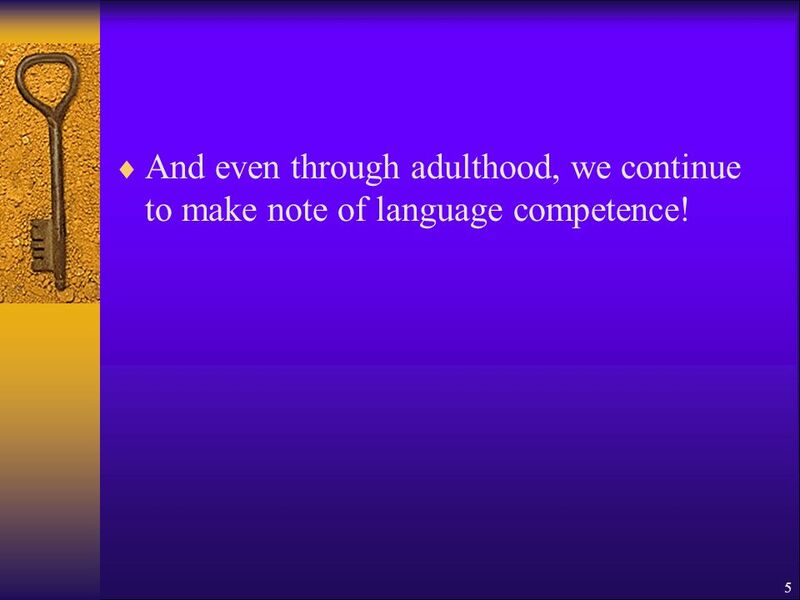 Additive bilingualism- Learning a second language while retaining ones original language. –Can happen by: 1. 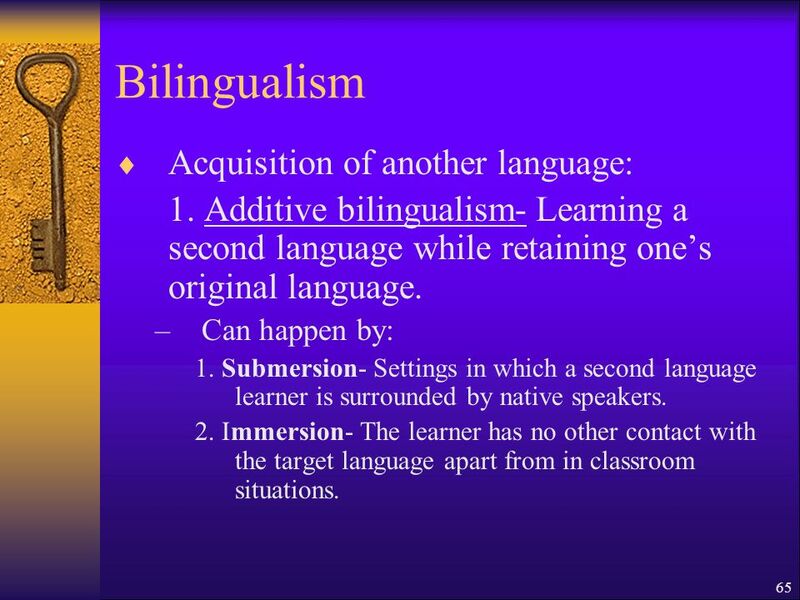 Submersion- Settings in which a second language learner is surrounded by native speakers. 2. 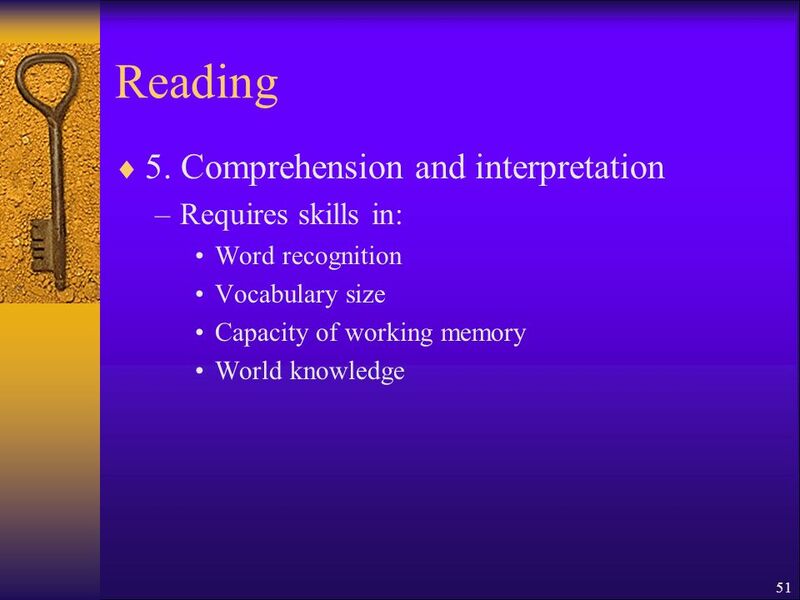 Immersion- The learner has no other contact with the target language apart from in classroom situations. 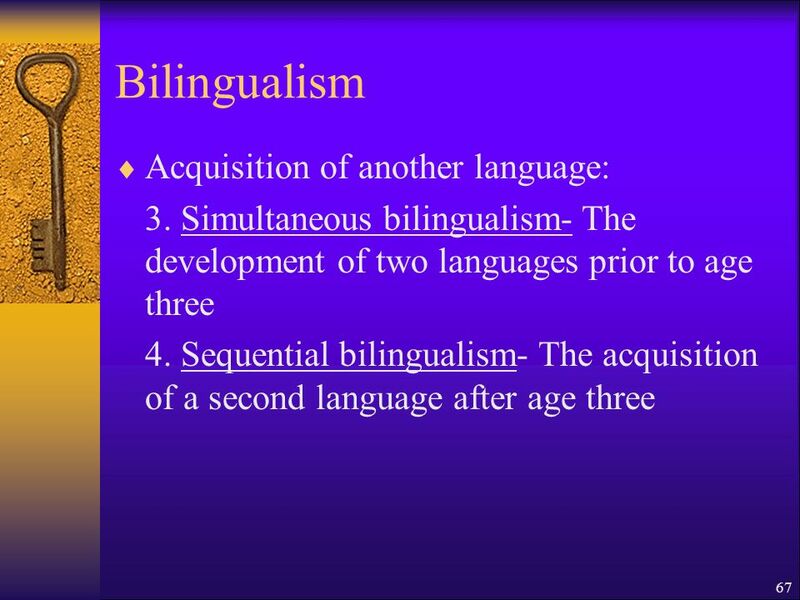 66 66 Bilingualism Acquisition of another language: 2. 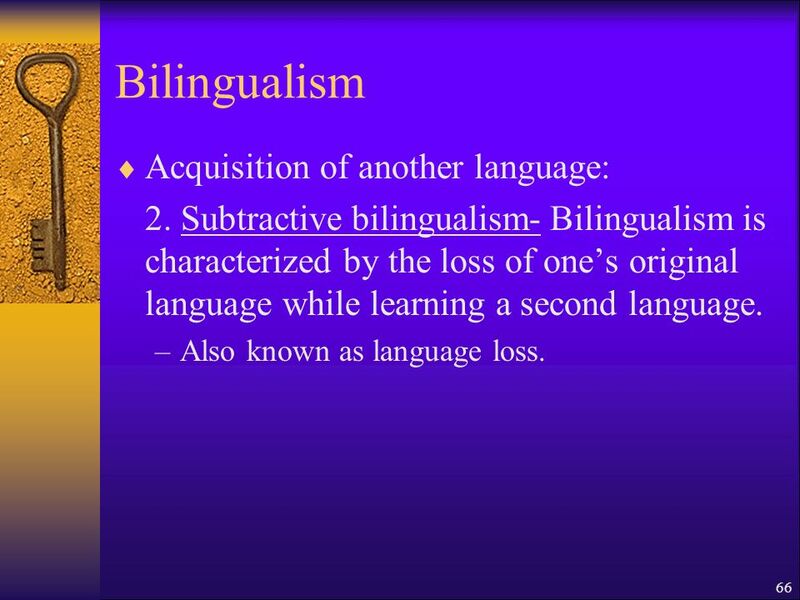 Subtractive bilingualism- Bilingualism is characterized by the loss of ones original language while learning a second language. 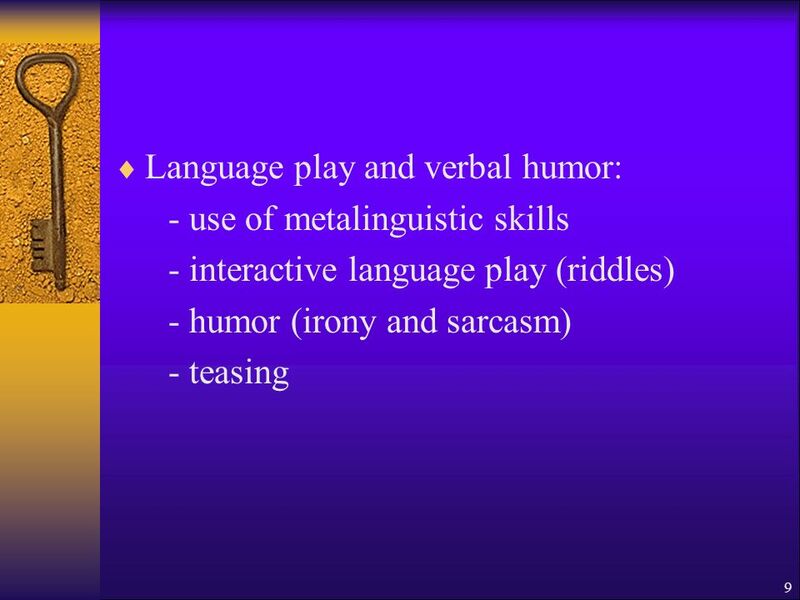 –Also known as language loss. 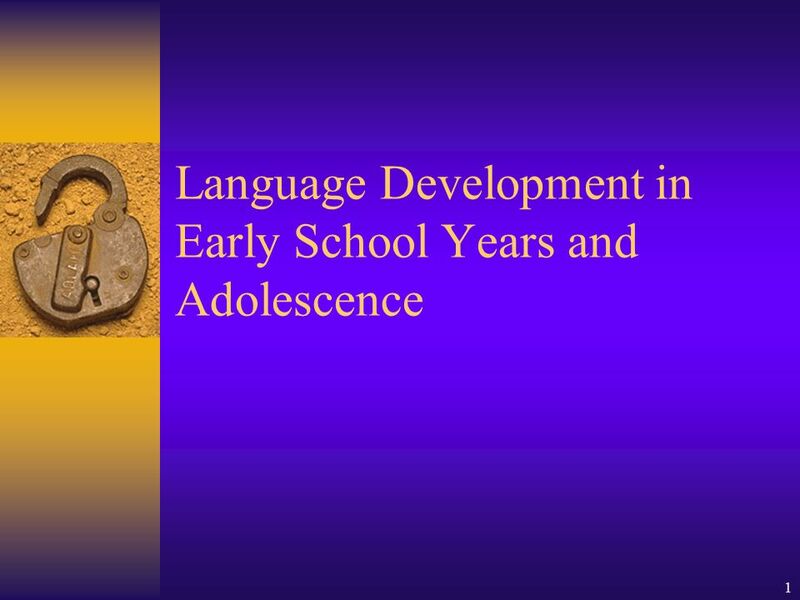 Download ppt "1 Language Development in Early School Years and Adolescence." Working document. Not to be distributed without CDE permission. 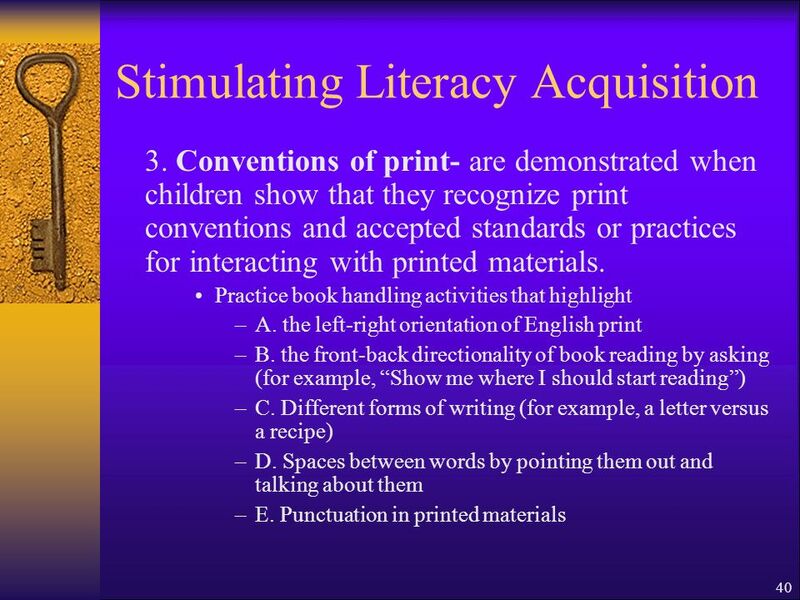 Preschool English Learners Training Manual – Chapter 3 48 Chapter 3: Connecting First and. 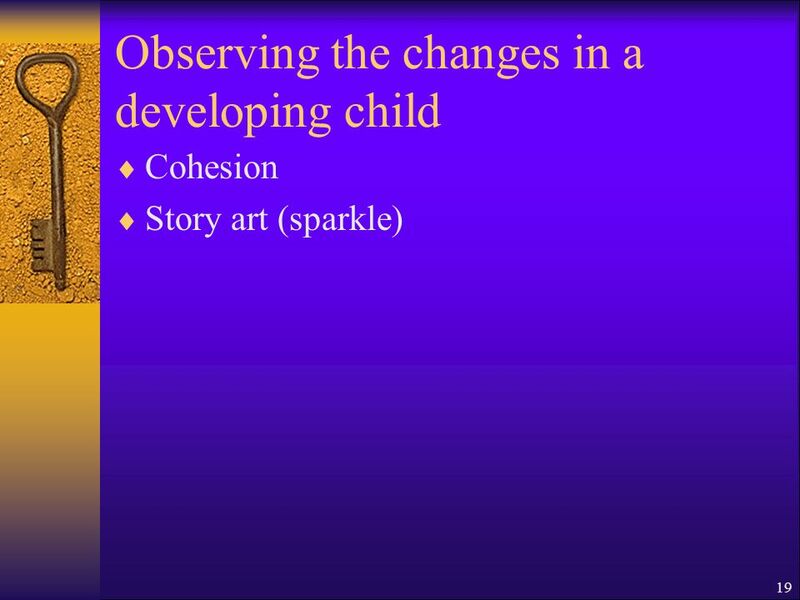 ©2012 California Department of Education (CDE) California Preschool Instructional Network (CPIN) 04/17/ © 2012 California Department of Education. 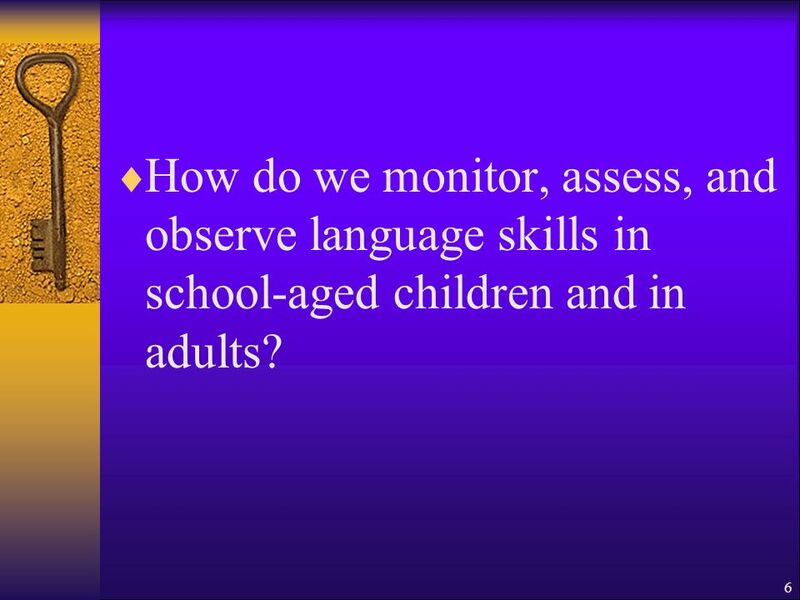 Comprehension and Analysis of Age-Appropriate Text Foundations and Framework Volume 1 © 2012 California Department of Education (CDE) California Preschool. 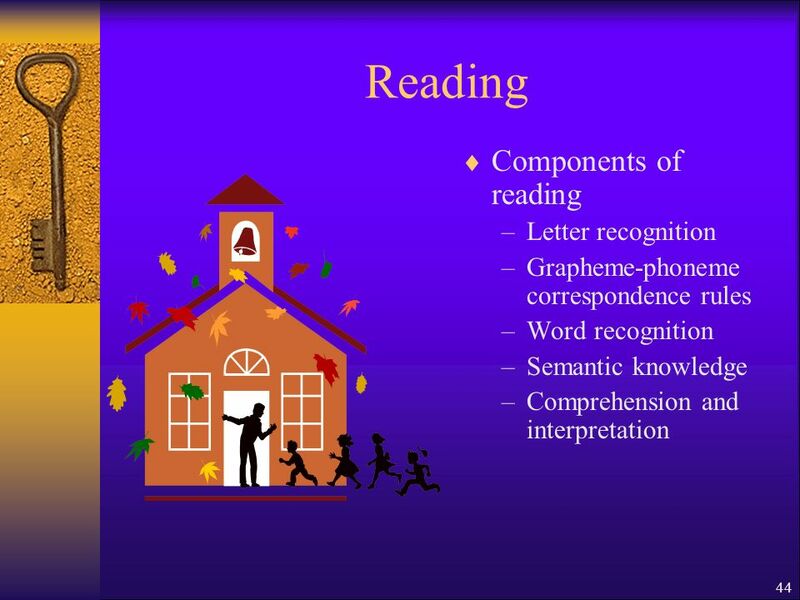 C Focus Education 20141 Assessing Reading: Meeting Year 1 Expectations Year 1 Expectations: Word Reading Match all 40+ graphemes to their phonemes (Phase.